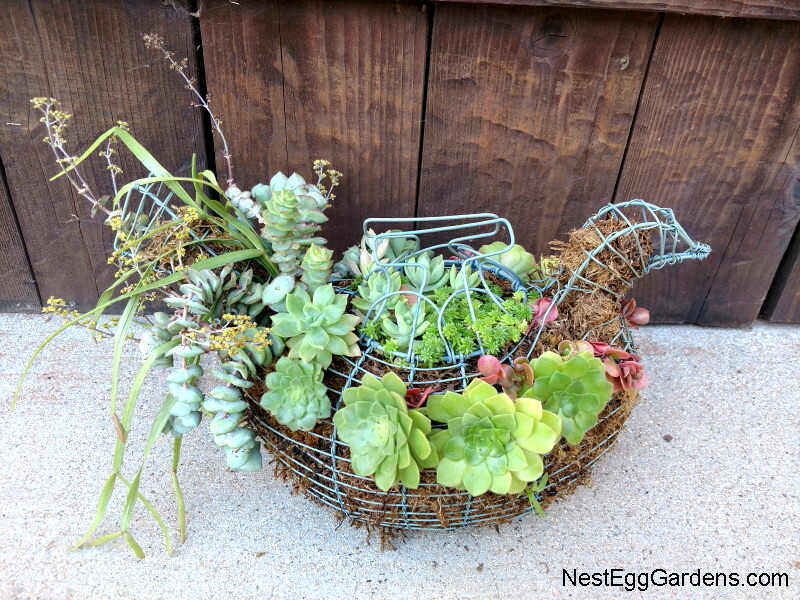 These wire frame chickens (and duck) are filling in nicely.. 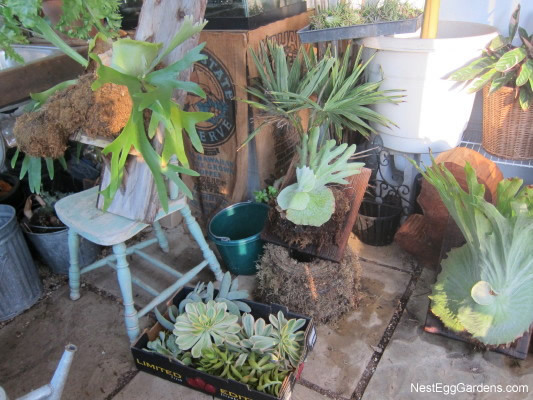 This entry was posted in Flora, For Sale, Hens, Succulents on November 8, 2018 by Shelly. 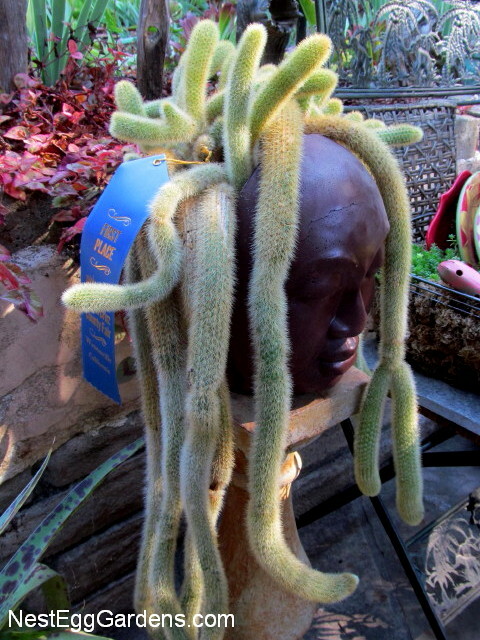 It’s always fun to enter things in the county fair and see what everyone else is doing… here are this year’s winners. 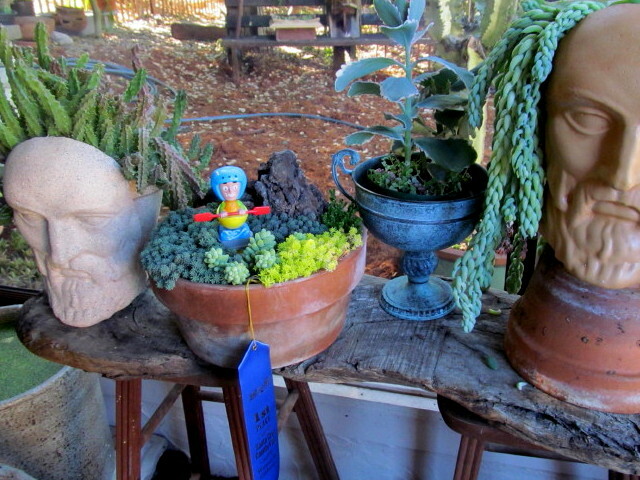 The succulent side table won First Place AND Best of Show!! 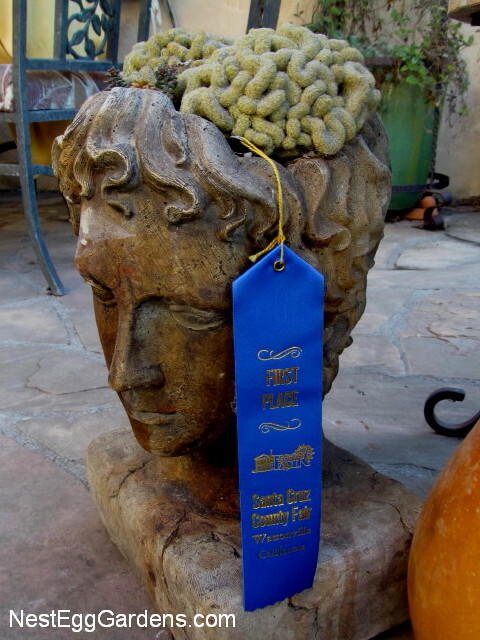 It was our first year entering the Compost Challenge… took 1st place and won $50 prize money. 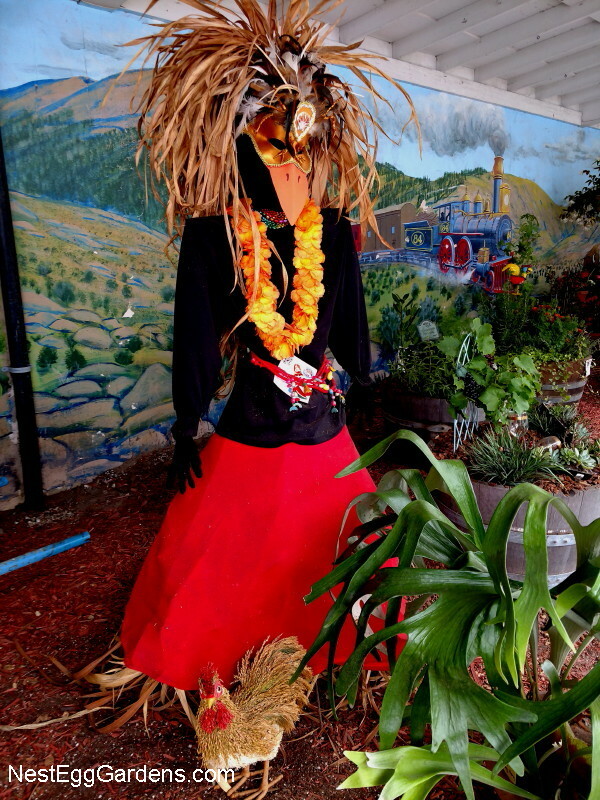 The scarecrow competition was pretty tough in the ‘Shake your tail feathers’ theme catagory… but we took home 2nd place. 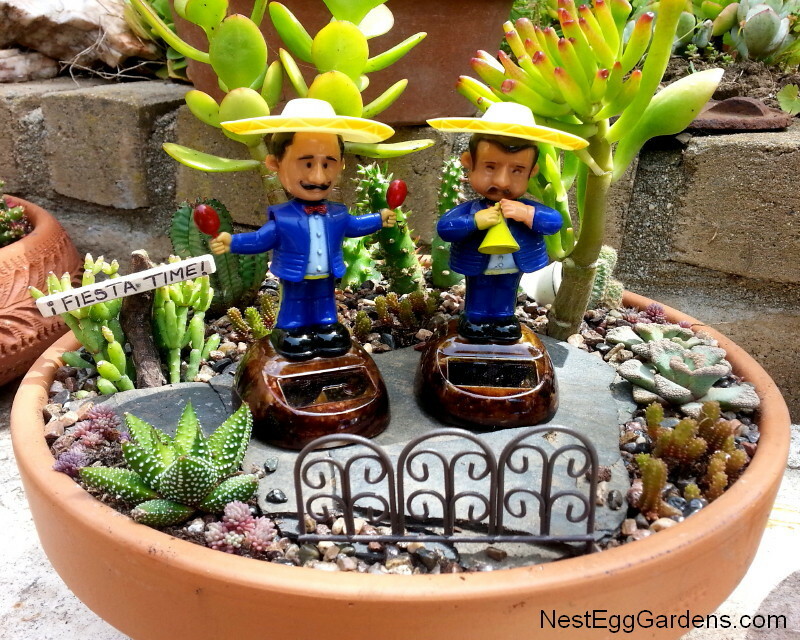 This entry was posted in Flora, Living Art, Succulents on September 5, 2018 by Shelly. 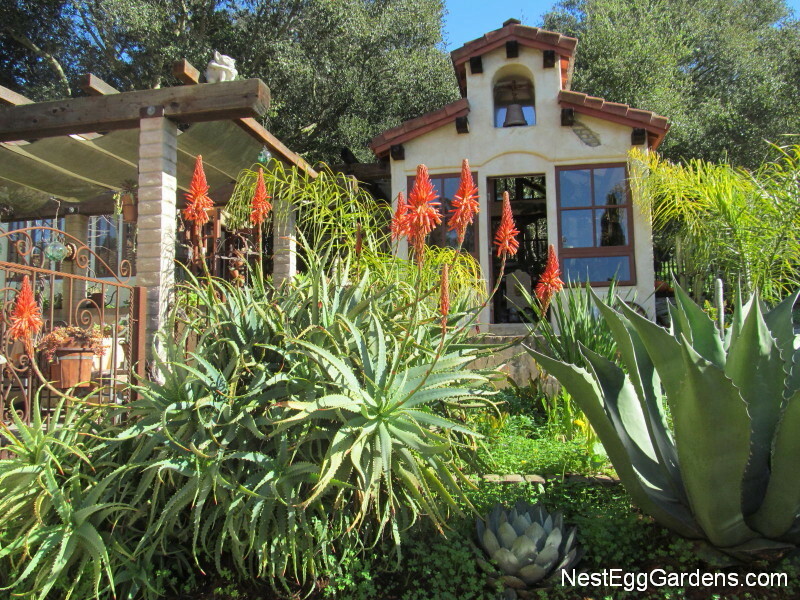 The hummingbirds love the huge aloe flower spikes. 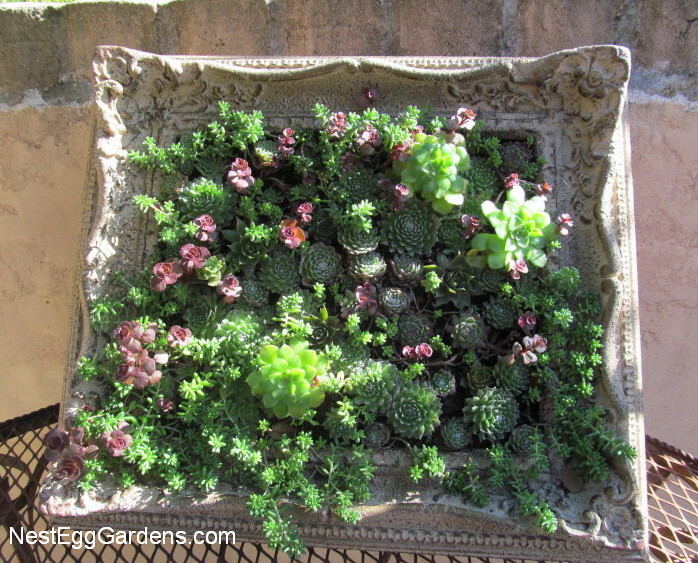 This succulent frame looks so pretty with the pink and green sedum poking out. 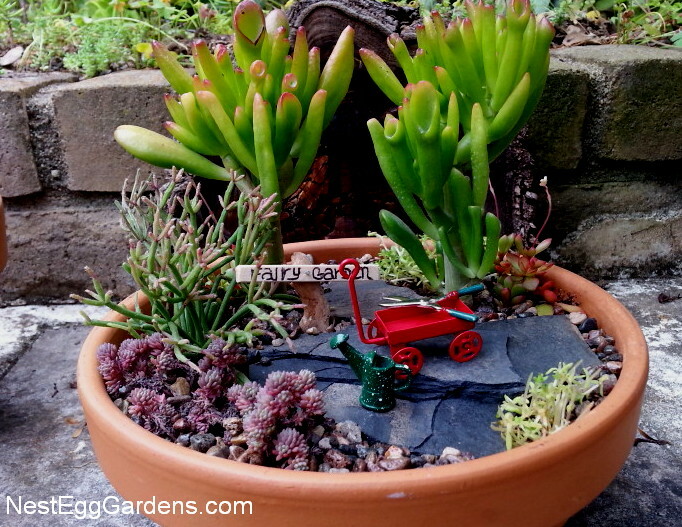 This entry was posted in Grounds, Succulents on January 18, 2017 by Shelly. All the beautiful dishes that have been hiding in my cupboards are now living among succulents in dish racks lined with moss. 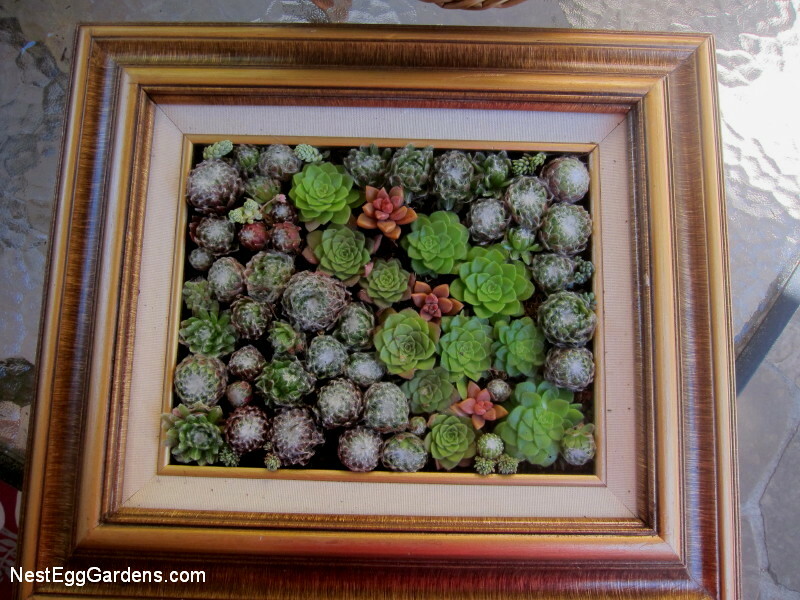 This entry was posted in Flora, For Sale, Living Art, Succulents on November 18, 2016 by Shelly. Checking out the exhibits at the fair every year is always so interesting. 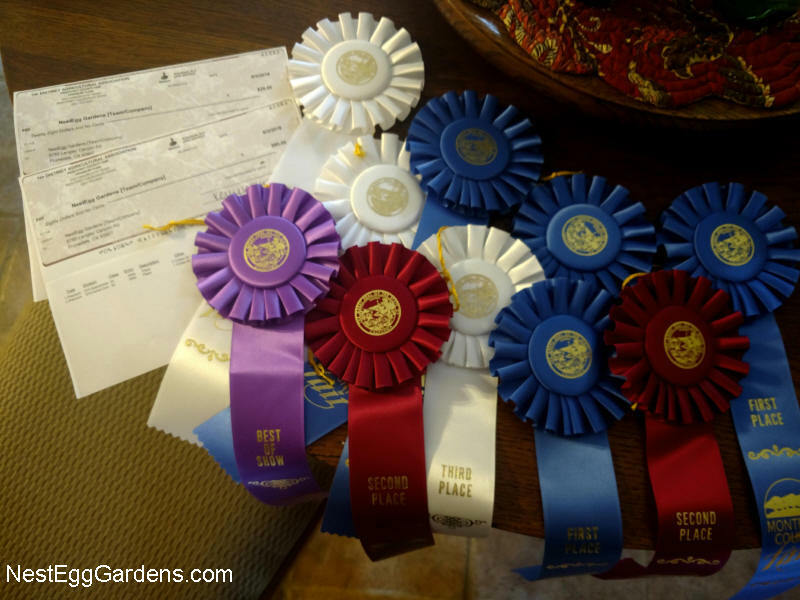 This was my first year with entries in the Santa Cruz County Fair… and brought home eight first place ribbons! 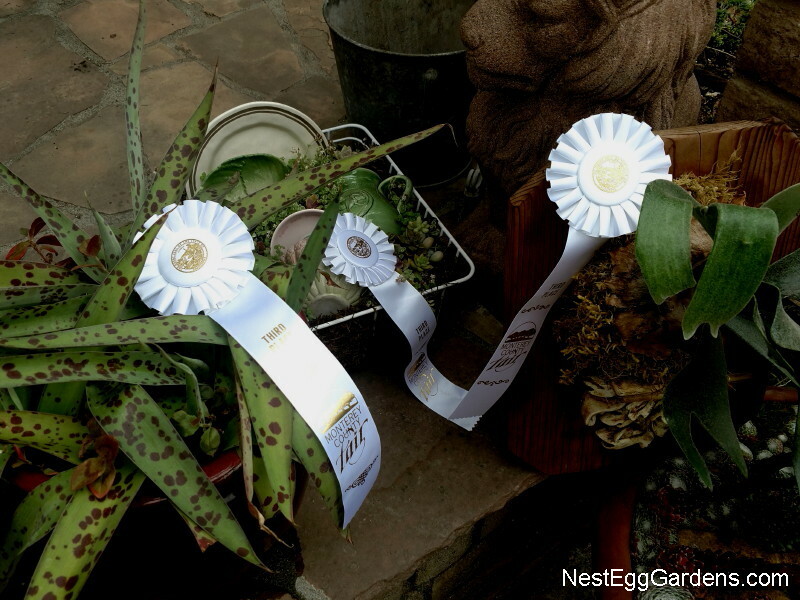 County fairs are always a fun competition and a chance to meet other plant lovers. 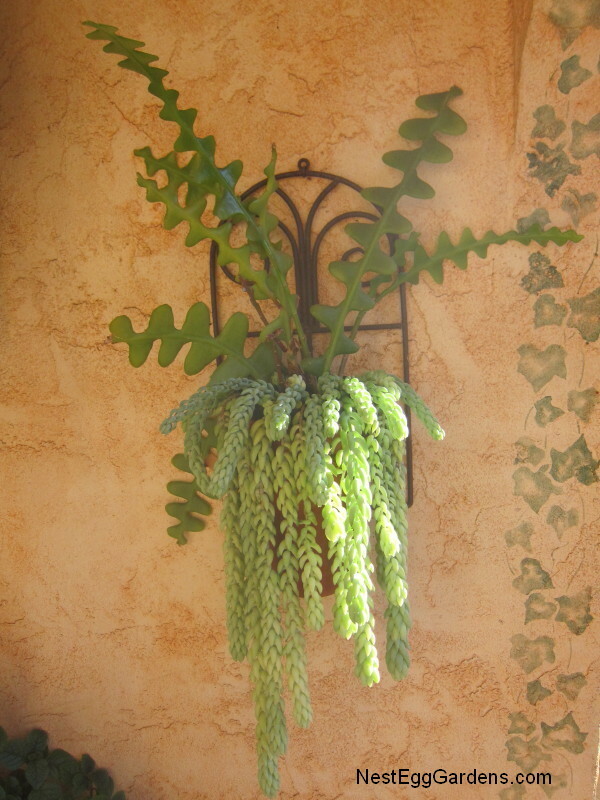 This entry was posted in Cactus, Living Art, Staghorn, Succulents on September 26, 2016 by Shelly. 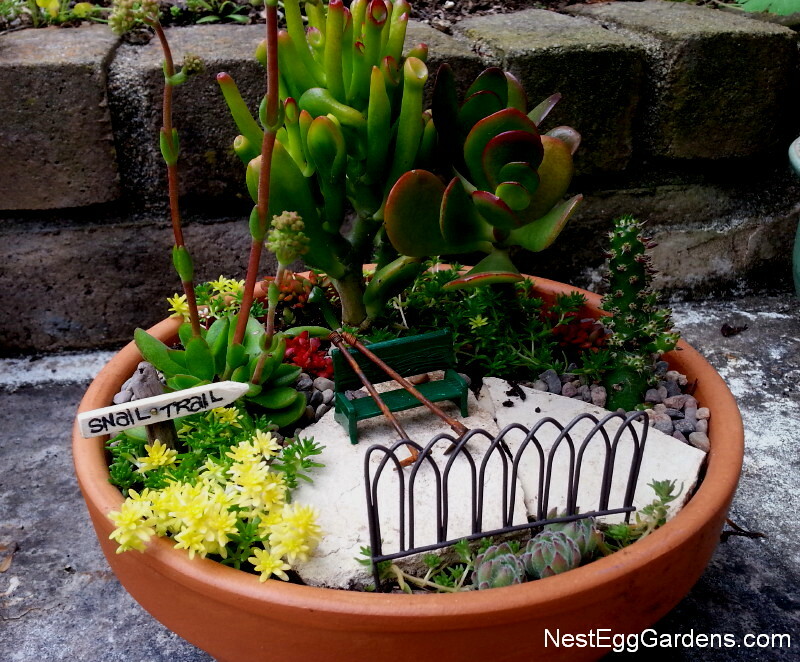 These small terra cotta pots with mini jade ‘trees’, sedums and cute tools & furniture make whimsical little gardens… the perfect size for fairies. 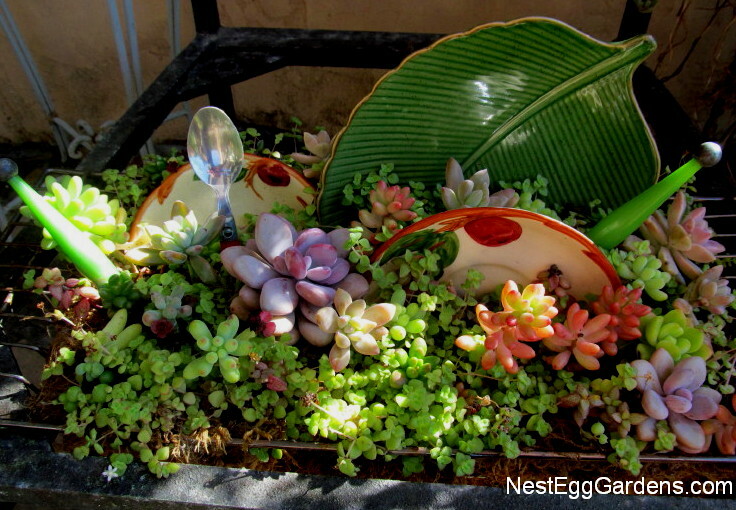 Water wise and easy to care for succulents, these fairy gardens will thrive for ages. 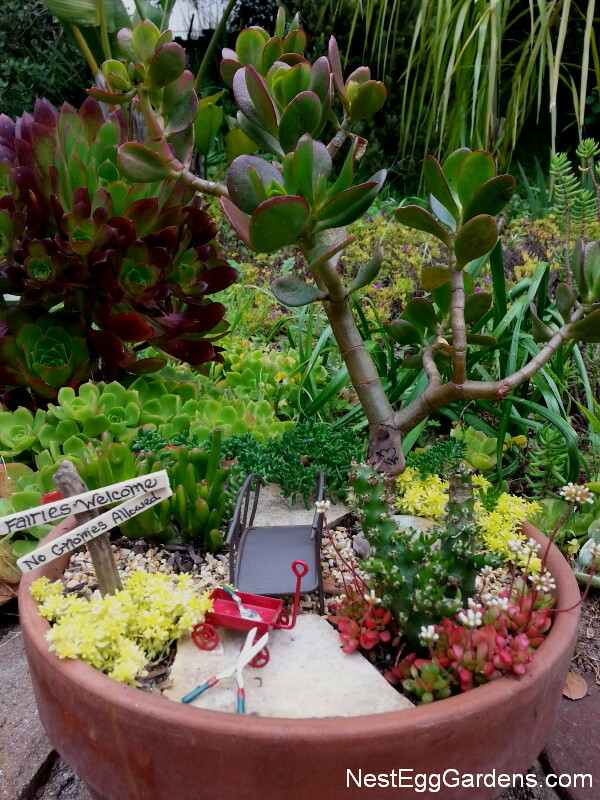 This entry was posted in Flora, For Sale, Living Art, Succulents on June 20, 2016 by Shelly. I’ve always loved pretty dishes and hate to hide them away in the cupboard. This is a nice way to enjoy them every day. 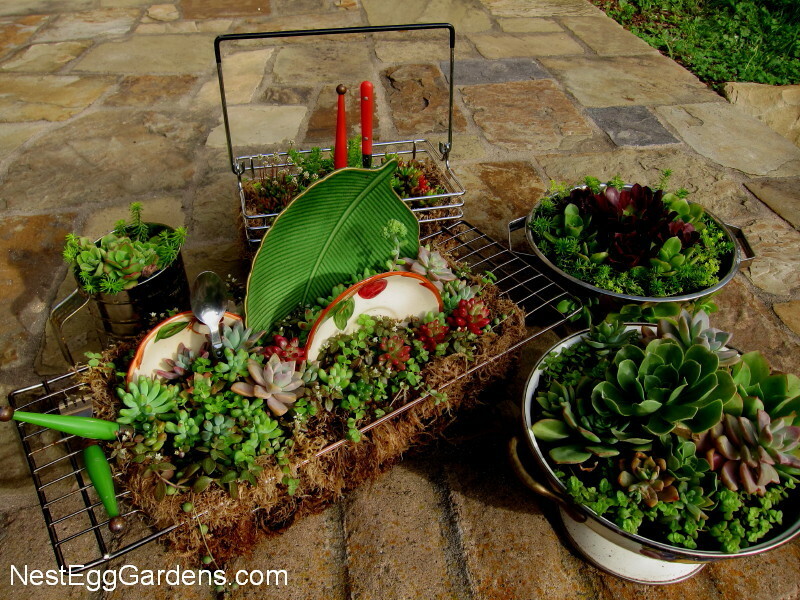 The salvaged dish racks are lined with moss and filled with potting soil and dishes. 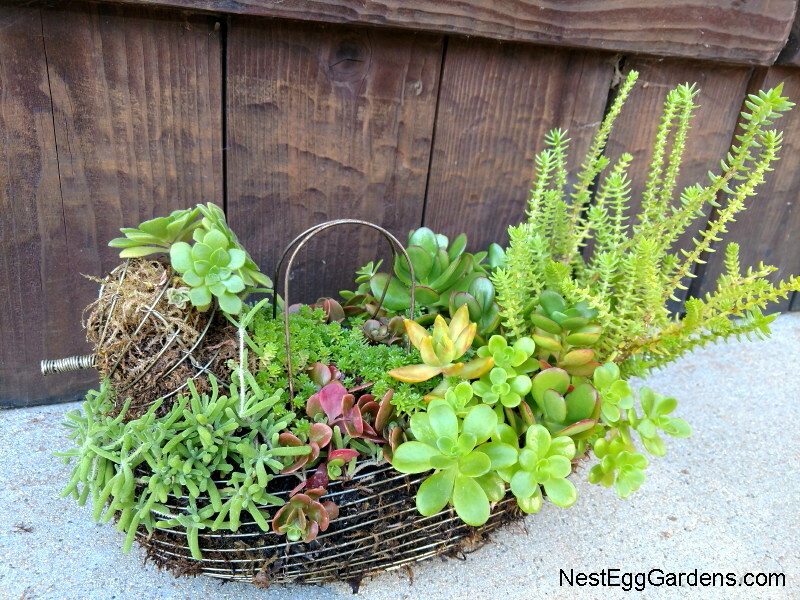 The succulents that I’ve chosen for these will stay compact and are meant to look like bubbles overflowing the sides. The silverware adds the finishing touch (and support for flowers). 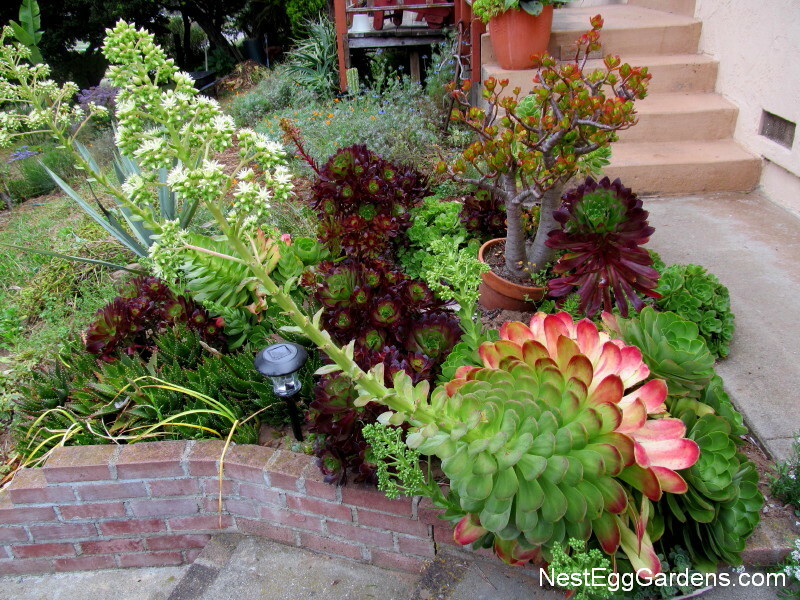 This huge aeonium flower stalk is amazing! Already trimmed off a couple dozen stems of blooms for table vases, and it’s still going strong. Love the way the lower leaves are turning color. 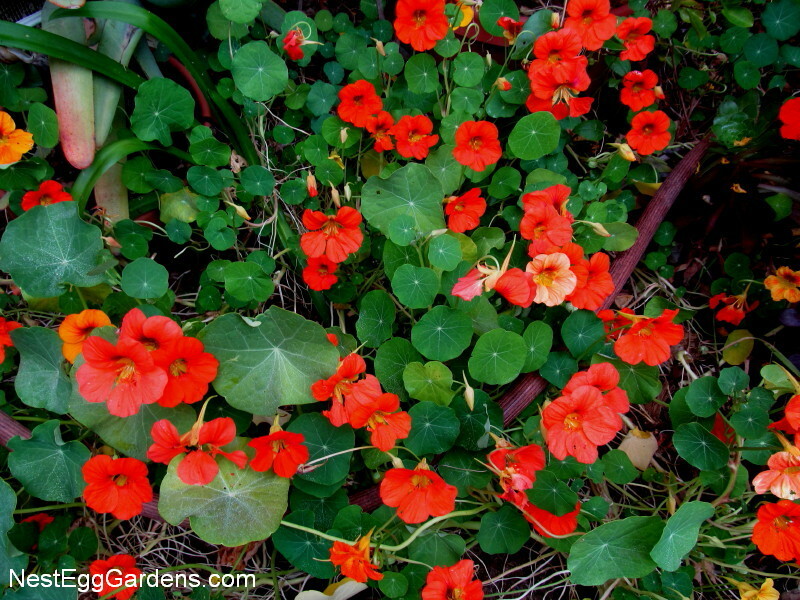 Nasturtiums climb over everything with their perky (and also edible) flowers. This cactus used to be a 4″ tall in a pot on my windowsill over 20 years ago. 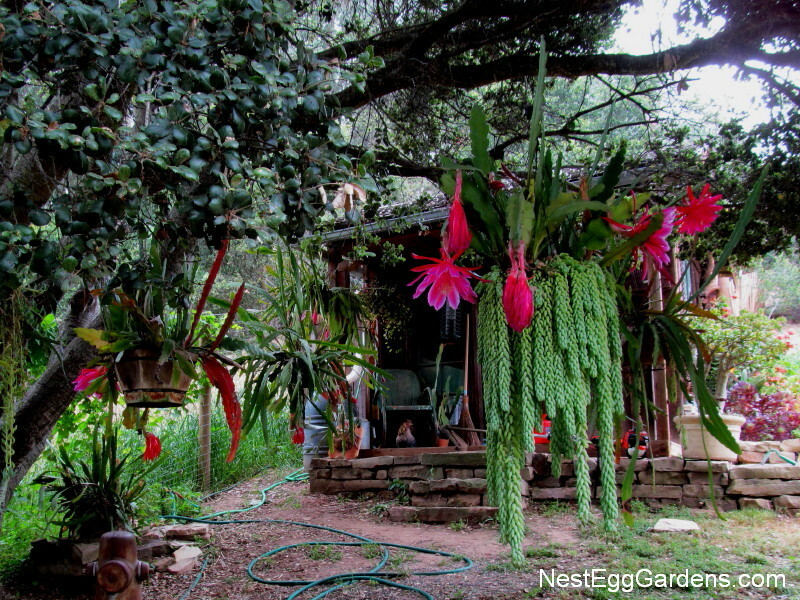 Epiphyllum mixed with burro tail succulents love the shade of this oak tree. This entry was posted in Cactus, Epiphyllum, Flora, Grounds, Succulents on June 10, 2016 by Shelly. 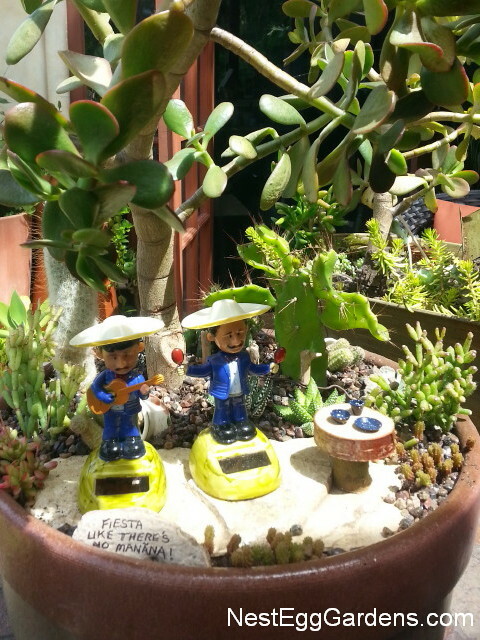 My solar mariachi men have found a home in this cactus cantina planted in an old colander… and they brought their friends. Just in time to celebrate Cinco de Mayo!! 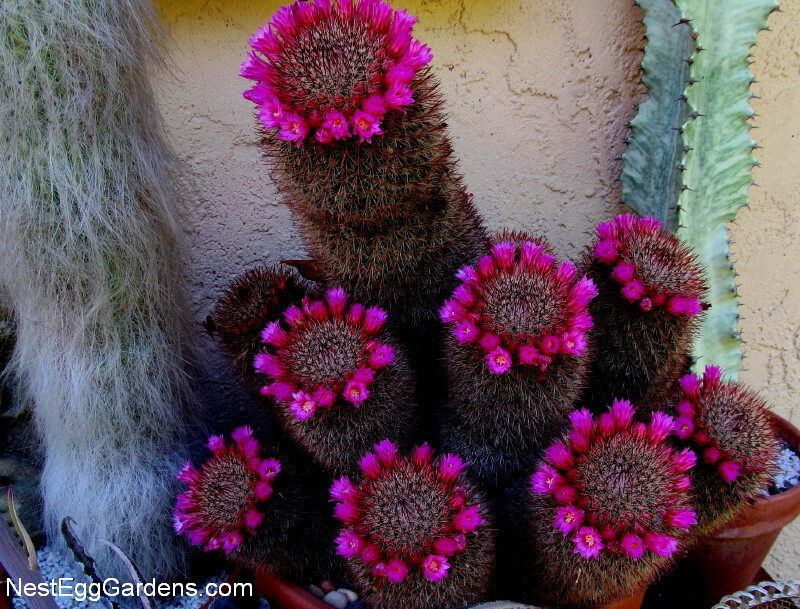 This entry was posted in Cactus, Flora, For Sale, Living Art, Succulents on April 30, 2016 by Shelly. It’s been busy around here, getting things ready for the Smart Gardening Fair. 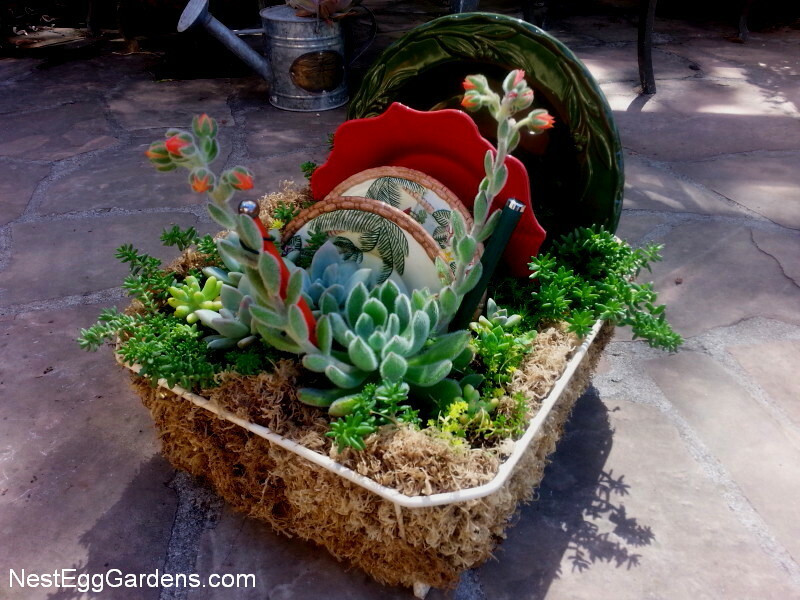 Kitchen containers such as colanders are so pretty planted with succulents. This succulent dish rack looks like soapy water bubbling over with dishes and colorful silverware mixed in. 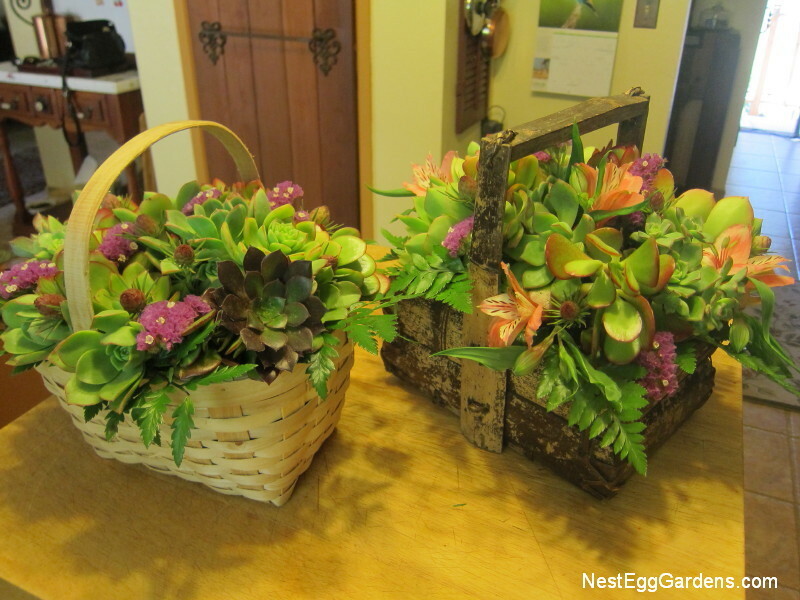 Frames, succulent bonsai trees and assorted baskets are ready to go. 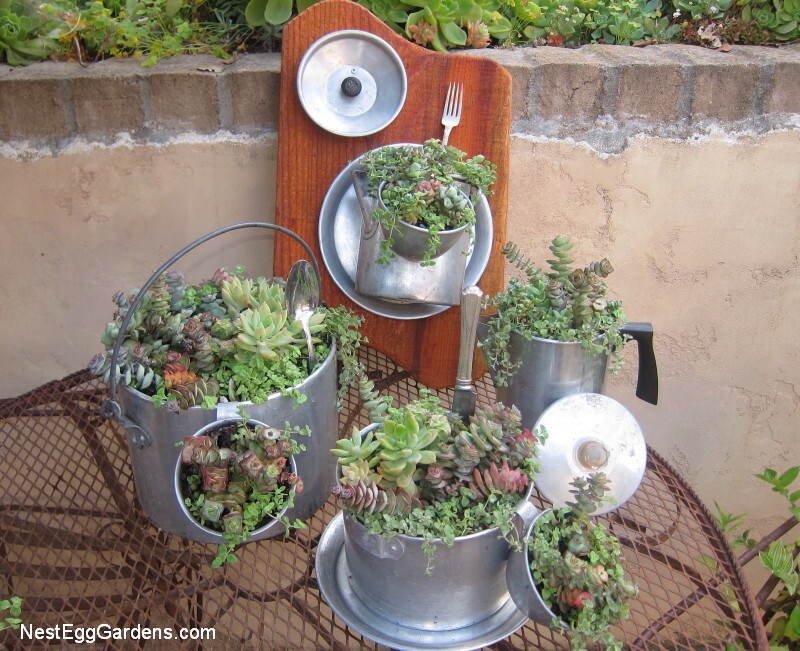 The succulents growing out of the watering can looks like water pouring out. 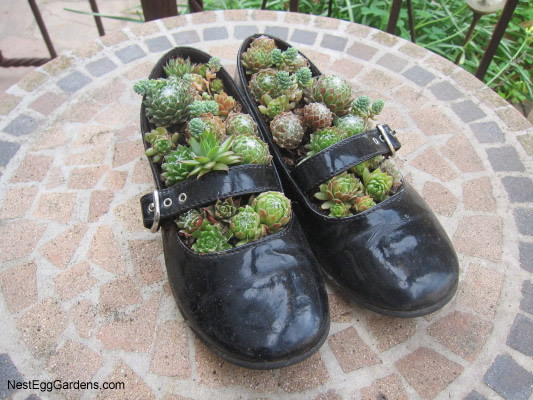 A planted side table holds a purse teacup and cute baby shoes filled with succulents. 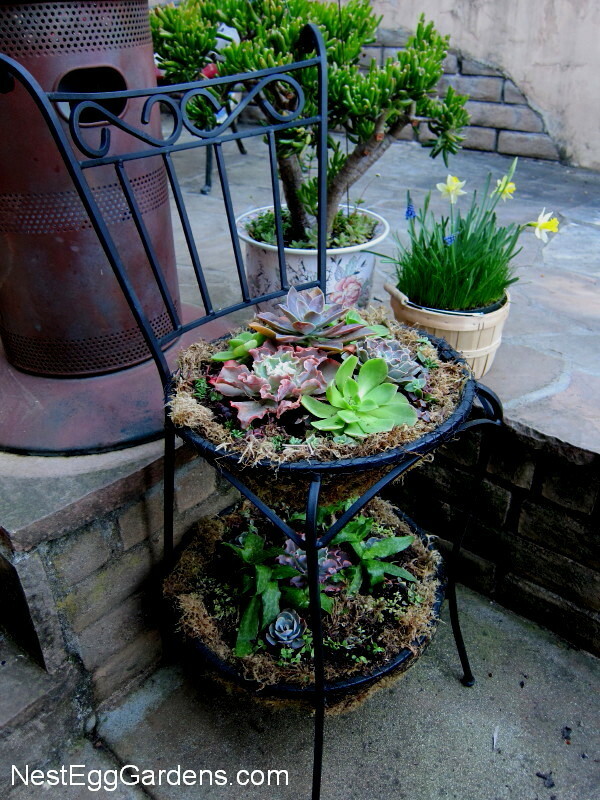 This iron bar stool is double-decked with succulents. 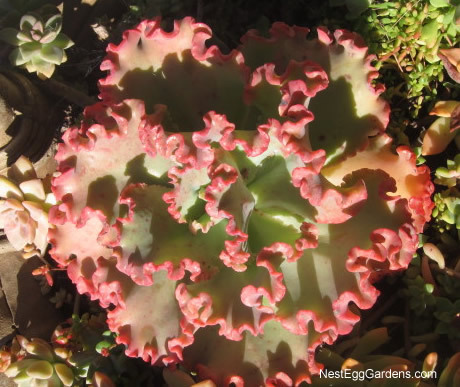 This entry was posted in Flora, For Sale, Succulents on March 11, 2016 by Shelly. 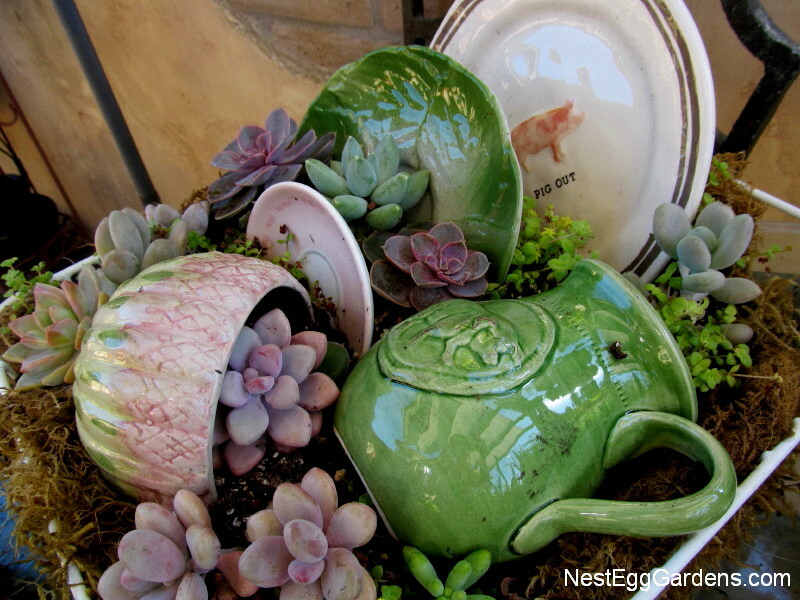 I put together these cute little succulent pots for holiday gifts during the first week of December. Just a small piece of floral foam stuffed into the pot, topped with moss… and a succulent cutting stuck in, to hold it together. Almost two months later, they are still thriving. The four on the left have been inside and are totally dry. The three on the right were outside on the patio, and are soaked from rain. So hardy and long lasting! And of course, they can be planted outside at any time. 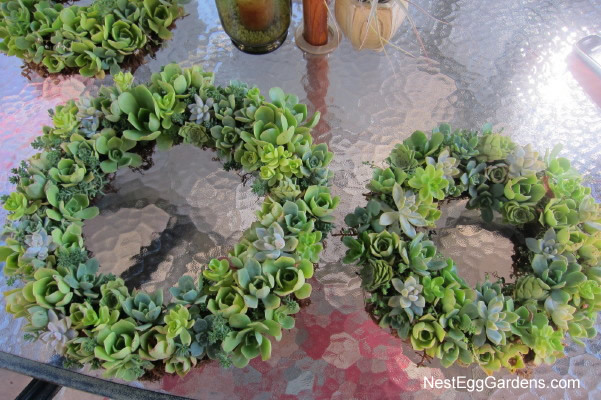 This entry was posted in Flora, Succulents on January 25, 2016 by Shelly. 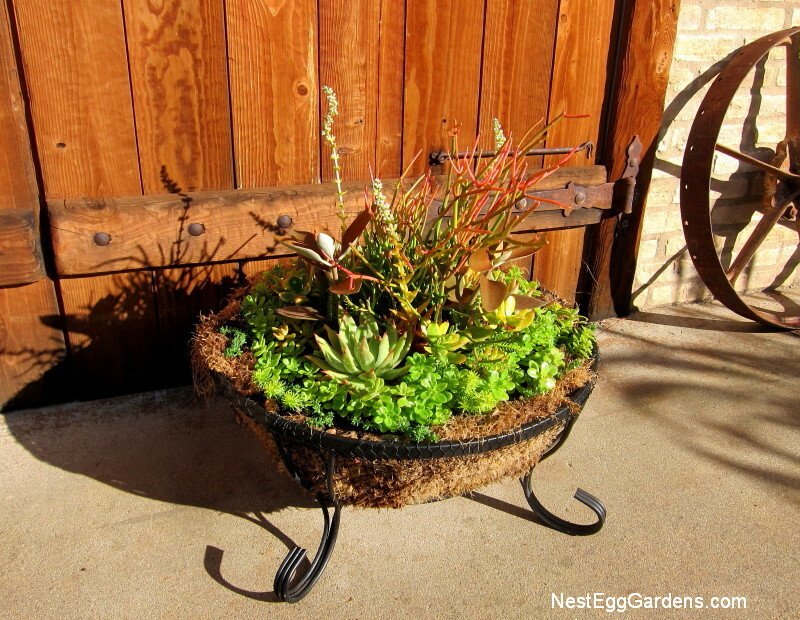 Found this fire pit frame at a yard sale and knew it would look good planted with succulents that looked like fire. First I lined it with aviary wire and sprayed it black. 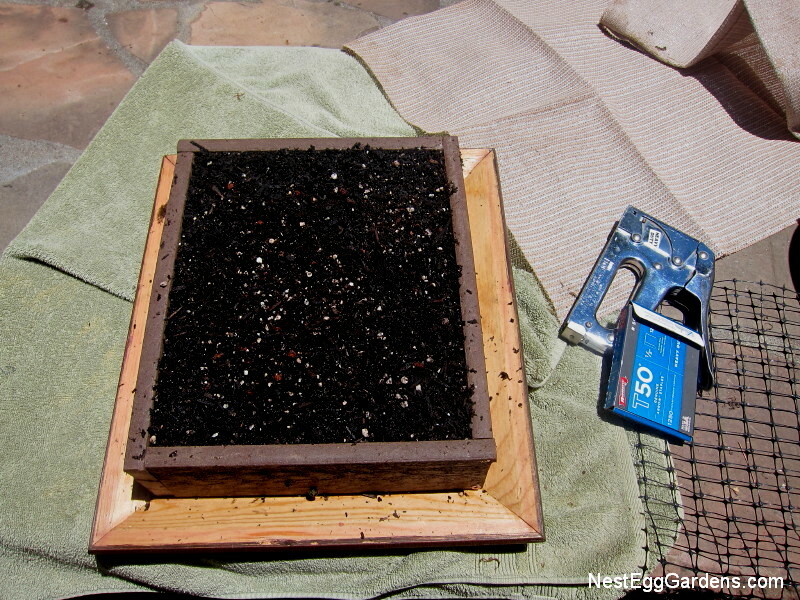 Then came a layer of moss, and potting soil. The ‘Campfire’ crassula capitella and Euphorbia tirucalli ‘Sticks on Fire’ really do look like flames. 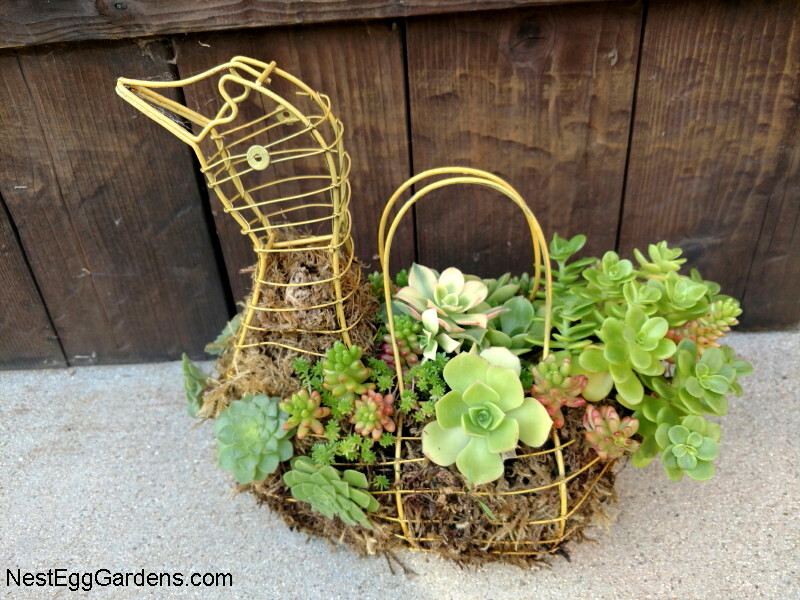 This entry was posted in Flora, Projects, Succulents on December 4, 2015 by Shelly. The Crassula campfire stretches up tall with small white flowers and the Crassula perfoliata below gets amazing blooms. I like how the grey/green sickle shaped leaves look like shark fins. 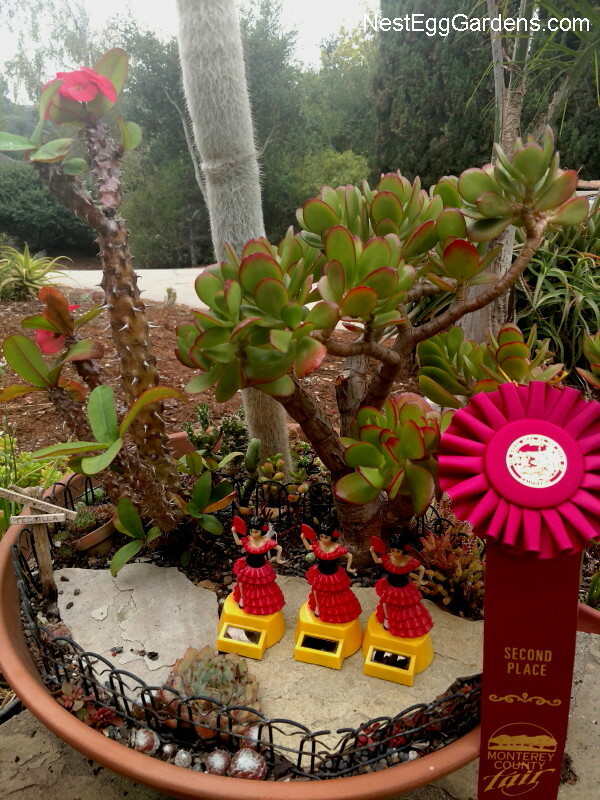 This entry was posted in Flora, Succulents on October 1, 2015 by Shelly. 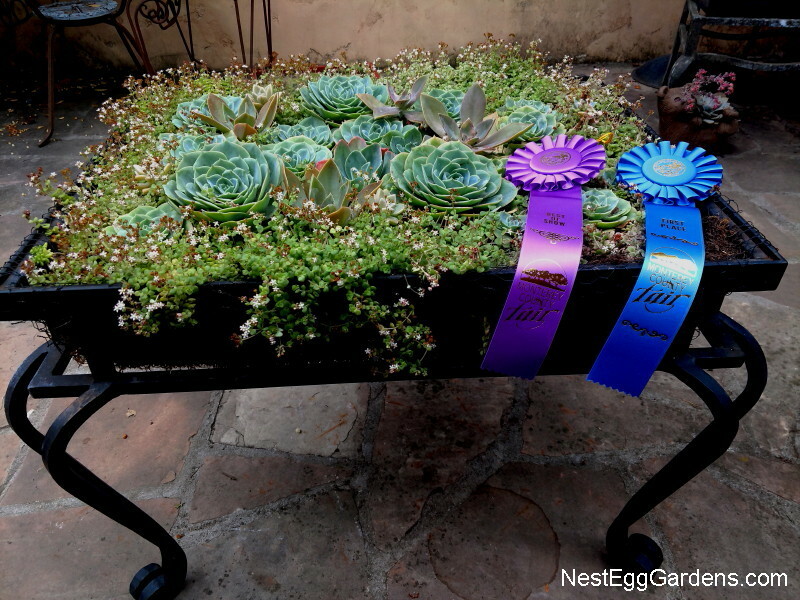 We’re excited that Nest Egg Gardens did so well at the fair this year! 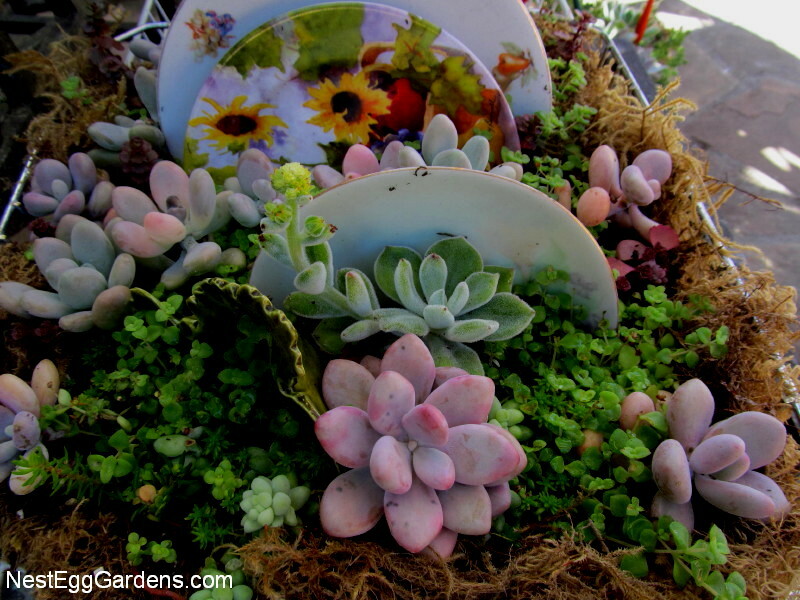 Participating is a fun way to showcase special projects and living art as well as a good way to meet other plant collectors. 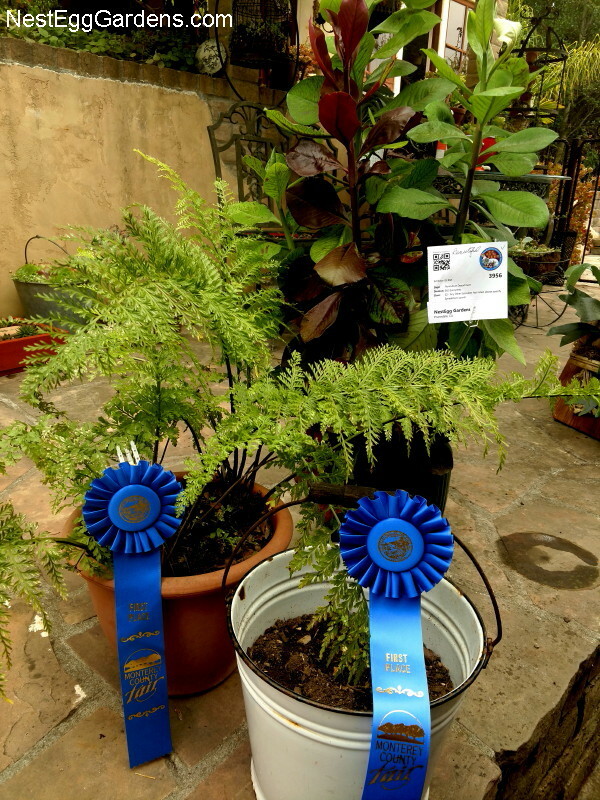 We brought home the special award for Excellence in Horticulture (aka grand prize). 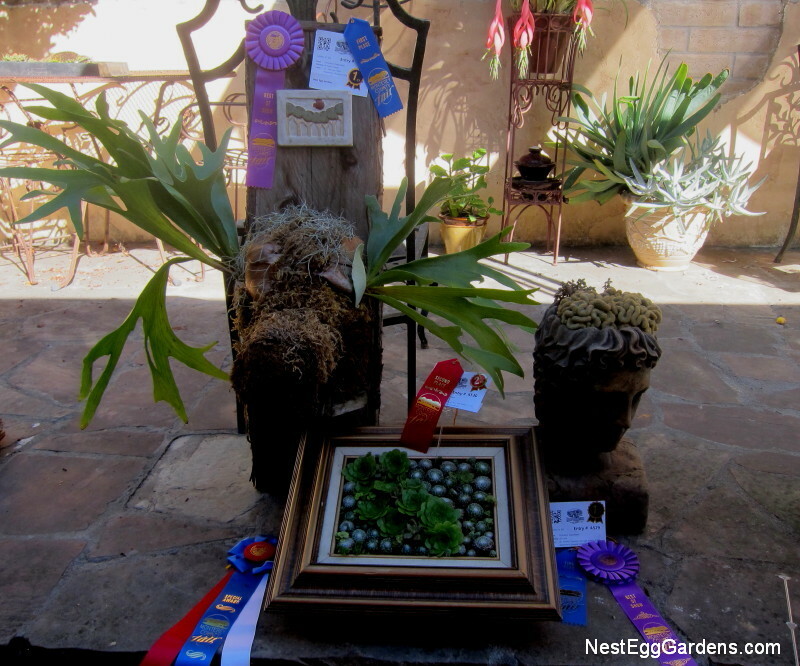 Two entries won both first place and Best of Show for their category: 1) our big staghorn fern that looks like a moose and 2) the double brain cactus in the head vase pot. 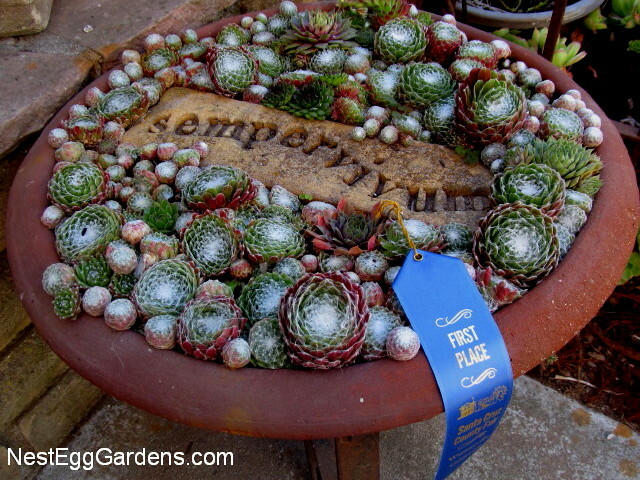 The succulent frame won 2nd place. The frame is one of the many works of art being donated by Aromas Artisans to the Art Raffle drawing November 22nd at the AHA Holiday Art Fair in Aromas. 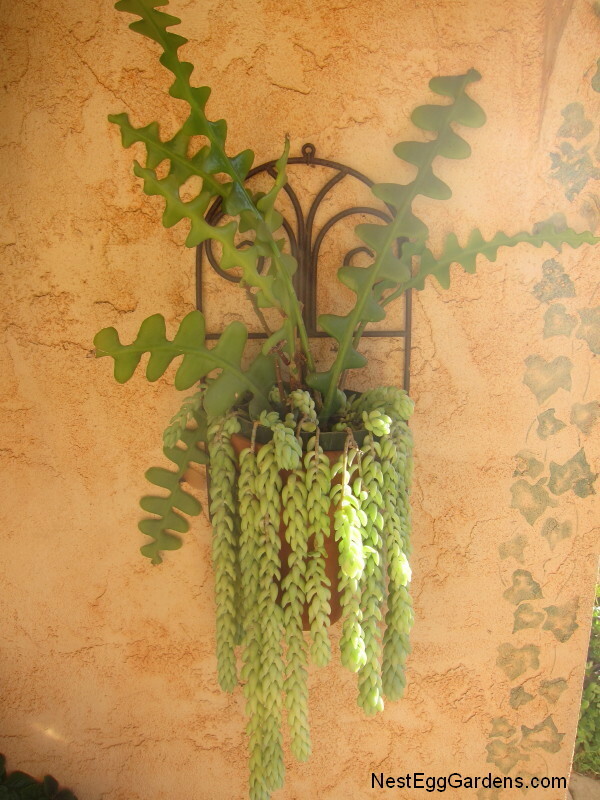 This entry was posted in Cactus, Flora, Living Art, Staghorn, Succulents on September 8, 2015 by Shelly. 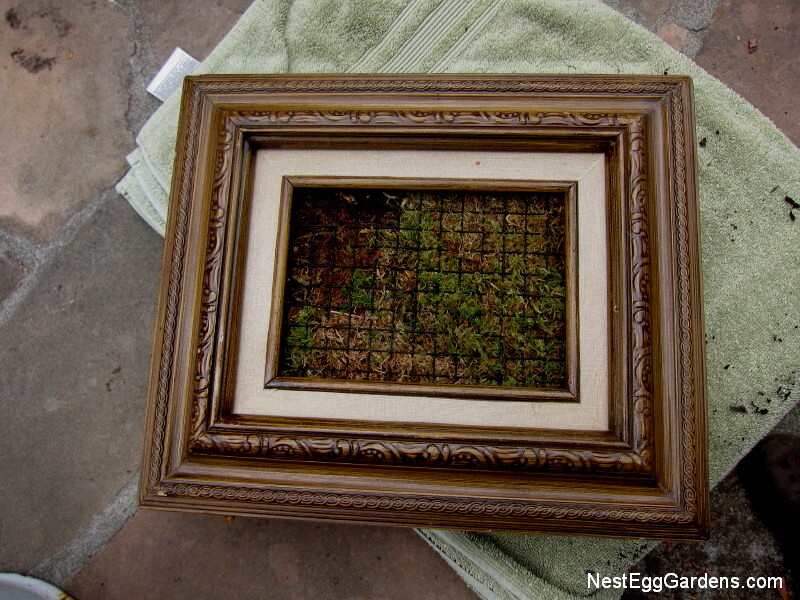 I got a few frames for free and thought I would try using them for succulents…. 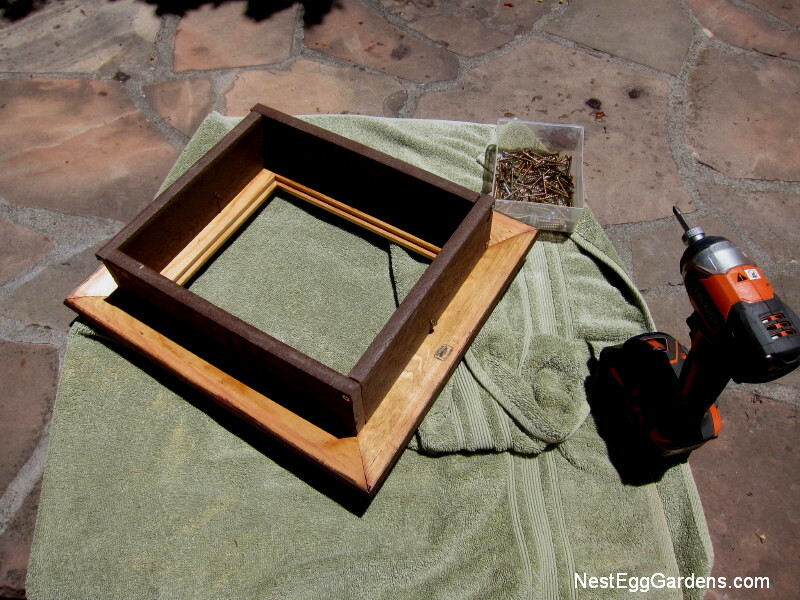 here’s how I did it: First I sprayed the inside edge with sealer to help it repel water and hopefully last longer. I built a box to fit using a composite decking board (it’s made with plastic and won’t rot). 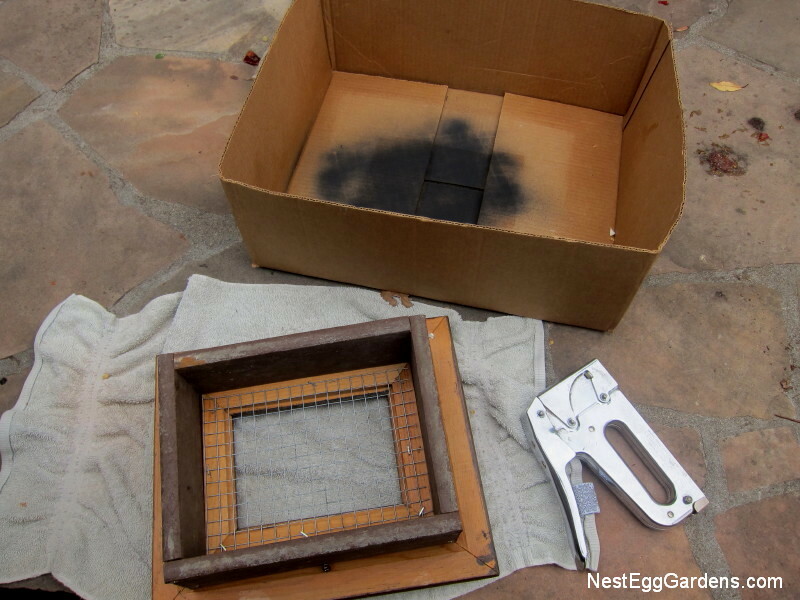 Sprayed one side of a piece of hardware cloth black (the dark color blends in better than shiny metal until the plants cover it up) and stapled inside. 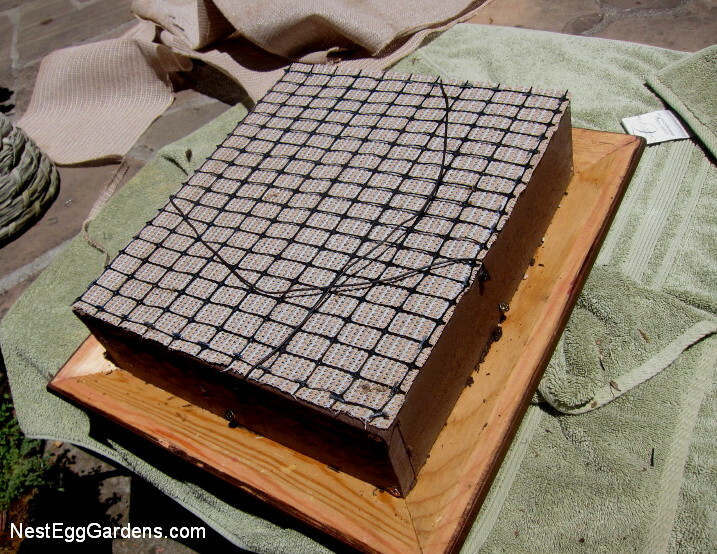 Lined the hardware cloth with a layer of moss and filled with potting soil (packed tightly). Stapled some shade cloth and plastic fence over the potting soil into the back and added wires for hanging (either vertical or horizontal). 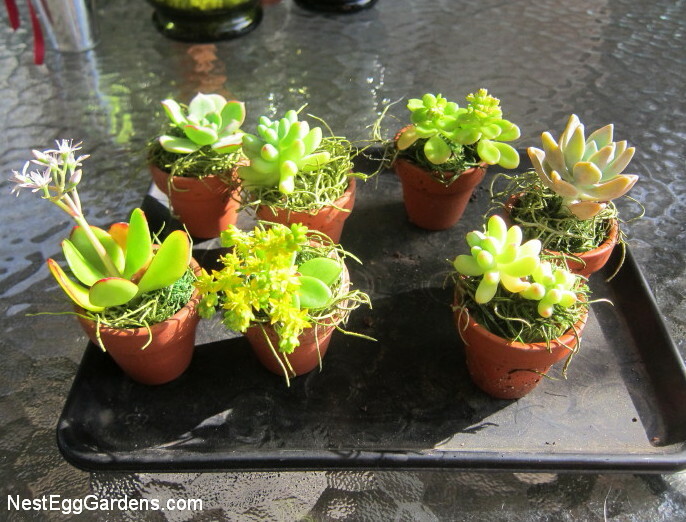 Inserted succulent cuttings by poking roots into the moss with a skewer or stick. Lie flat and water regularly until the cuttings are rooted well before hanging. 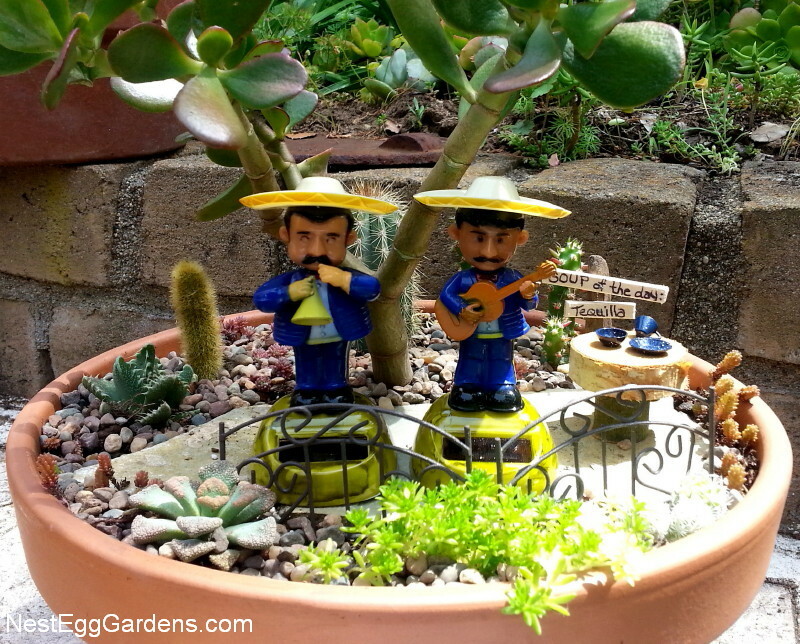 This entry was posted in Flora, Living Art, Succulents on July 12, 2015 by Shelly. 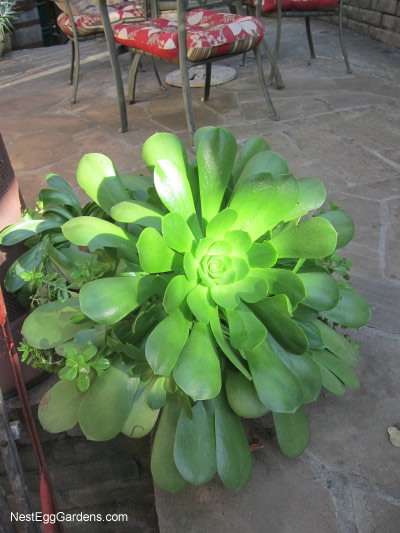 This huge Aeonium davidbramwelli has shot up multiple stems. The flowering inflorescences on this large variety can be three feet tall and nearly as wide. 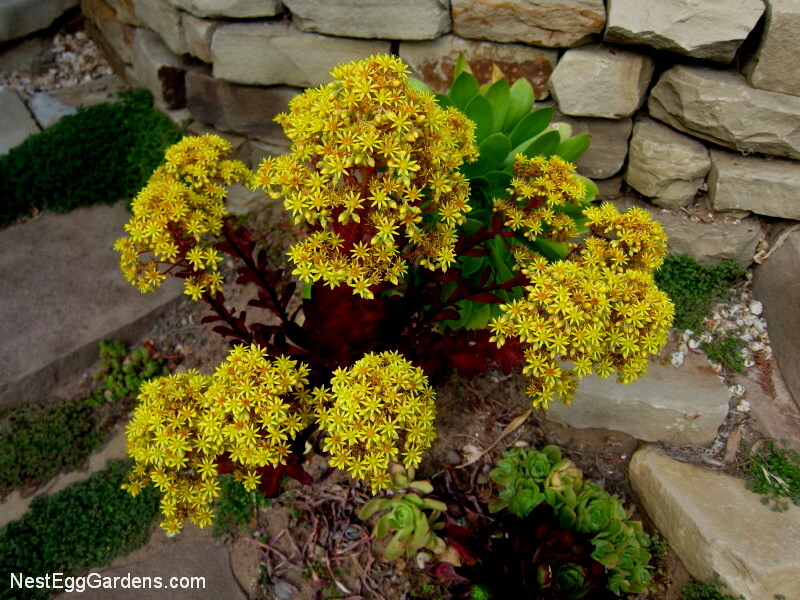 This red variety (Aeonium zwartkop) produces lots of long lasting yellow flowers. 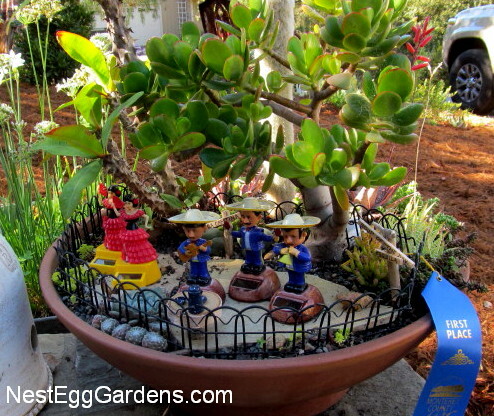 This entry was posted in Flora, Succulents on May 18, 2015 by Shelly. 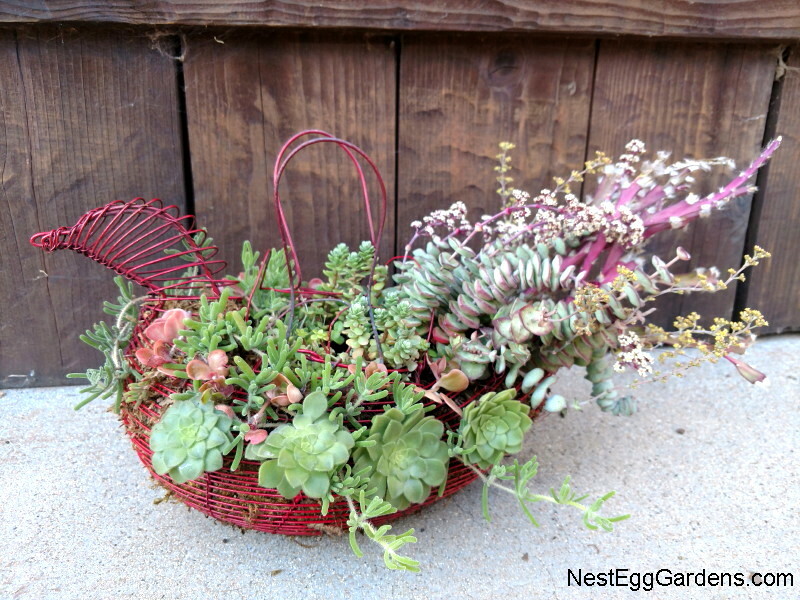 Combining fresh flowers with succulent cuttings looks great in baskets. These were perfect for Easter. 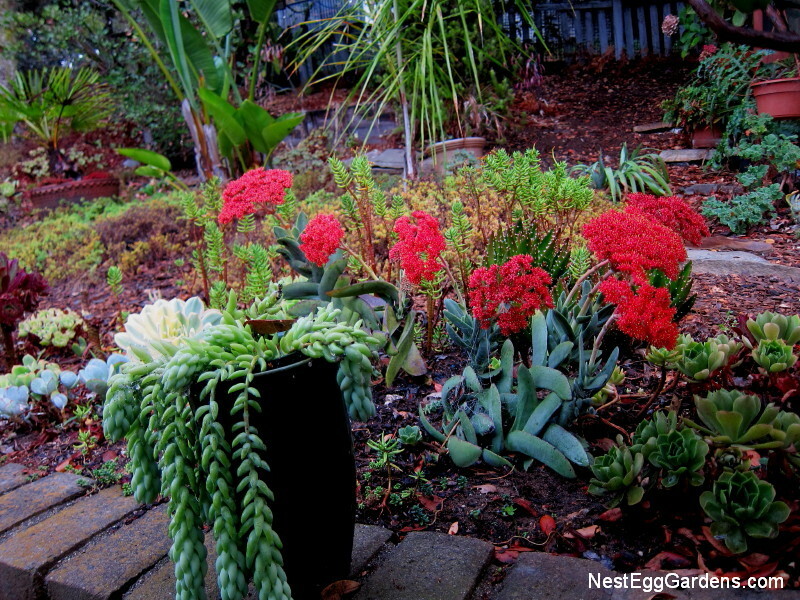 After the flowers fade, the succulents will last for months, growing into the floral foam. Or they can be potted up or planted in the yard. 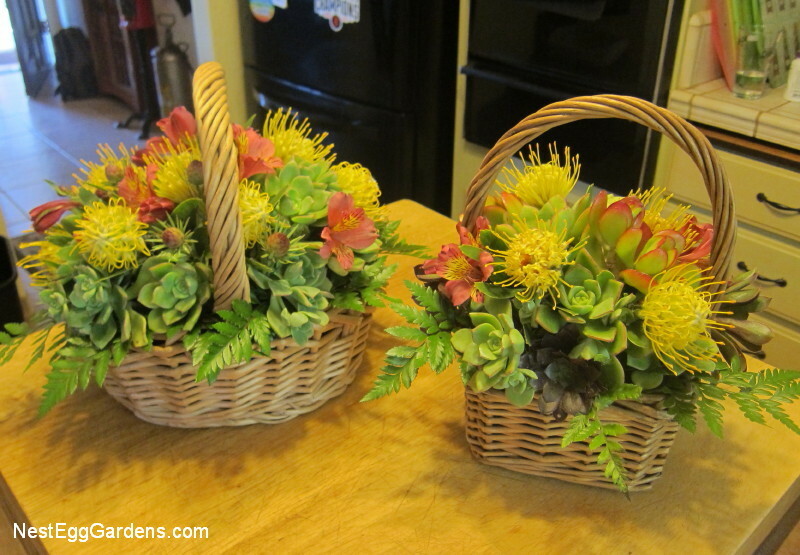 This entry was posted in Arrangements, Flora, For Sale, Living Art, Protea, Succulents on April 9, 2015 by Shelly. Promised to post this picture for a customer at the Smart Gardening Fair yesterday. 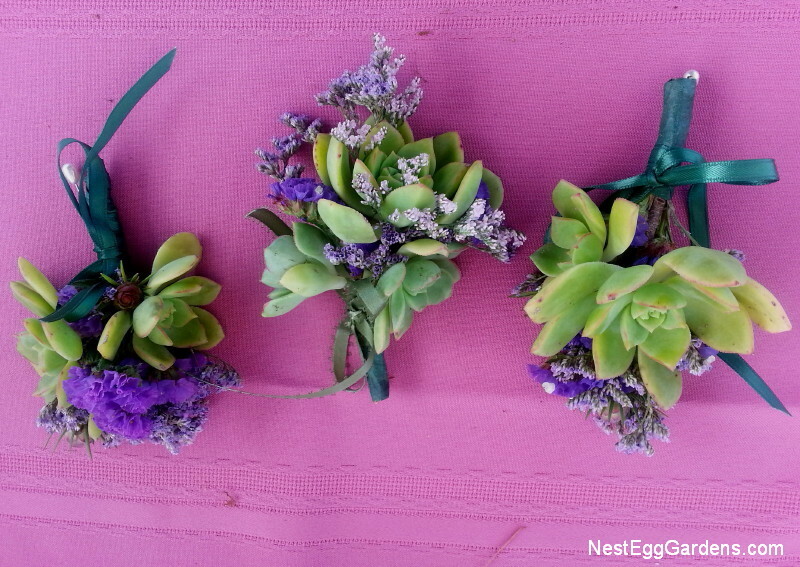 These mini corsages or boutonnieres made from succulents and statice will last for weeks. 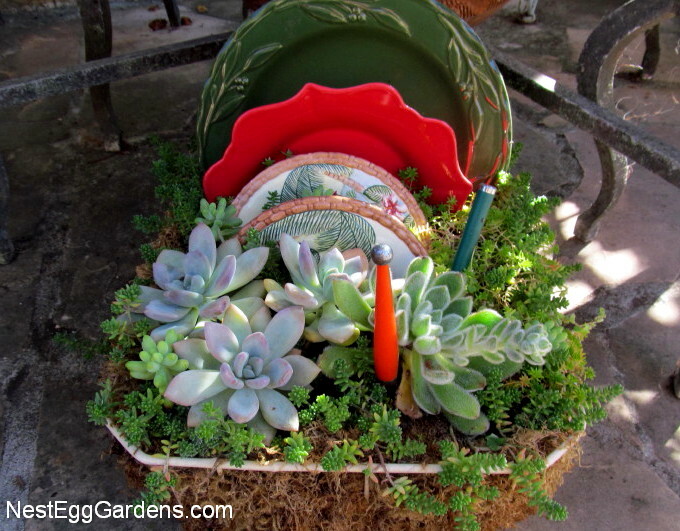 The succulents will last forever if potted up or planted in your yard. 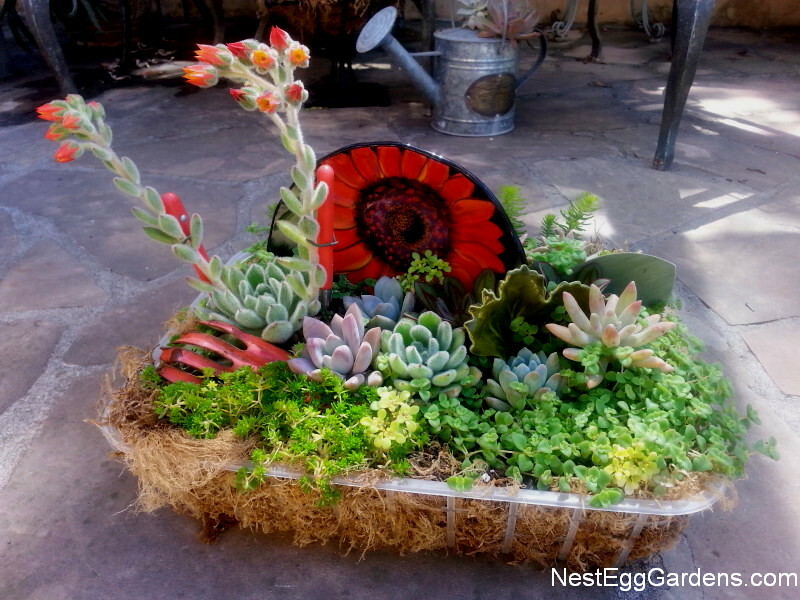 This entry was posted in Arrangements, Flora, Succulents on April 5, 2015 by Shelly. When I found this camping kit at a yard sale, I thought it would make a cute succulent display. 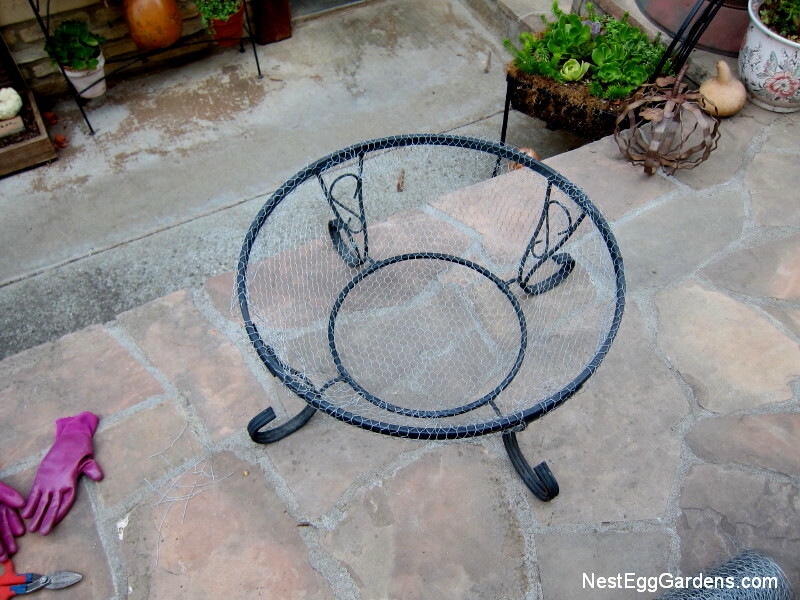 Since it’s aluminum, it won’t rust and drilling holes in the bottom was easy. I really like how the cups hang off the side just like a punch bowl. 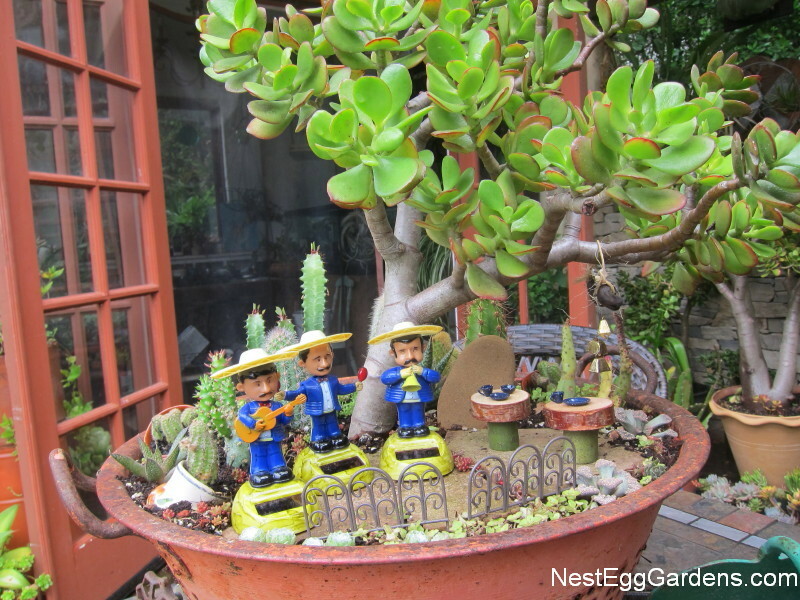 This entry was posted in Flora, Living Art, Succulents on April 1, 2015 by Shelly. 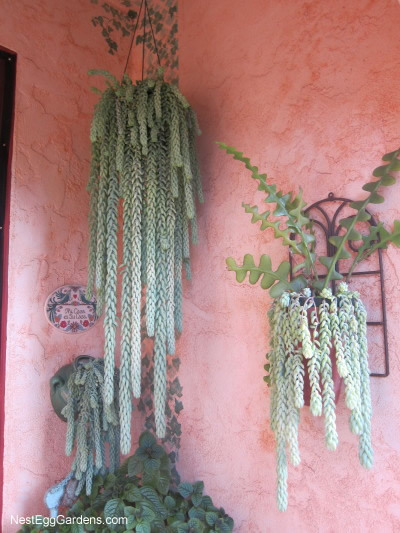 Three pots of Sedum morganianum (aka Burro tail) are thriving on the front porch in mostly shade. These plants have slightly fatter stems than Donkey tail. Both are delicate and drop leaves easily when disturbed, but these pots could really use a trimming. The cuttings are stripped of leaves for a few inches on the end and can be potted up to make a new plant or can be added to existing pots, by first poking a hole with a stick or skewer . The leaves can be also sprouted into new plants by laying on top of the soil in a flat or 6-packs. 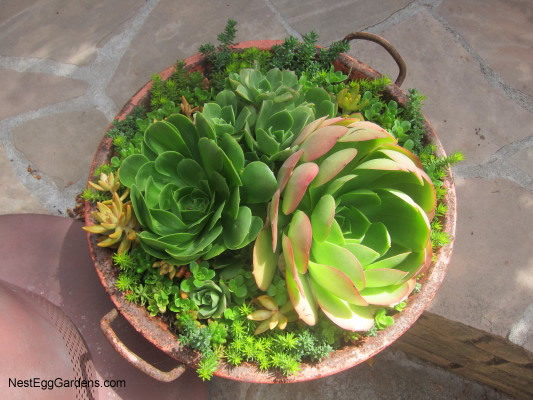 This entry was posted in Flora, Succulents on February 24, 2015 by Shelly. Sempervivum arachnoideum (aka cobweb house leek) is one of the hardiest of succulents. They stay compact which makes them perfect for shoes and other small containers. 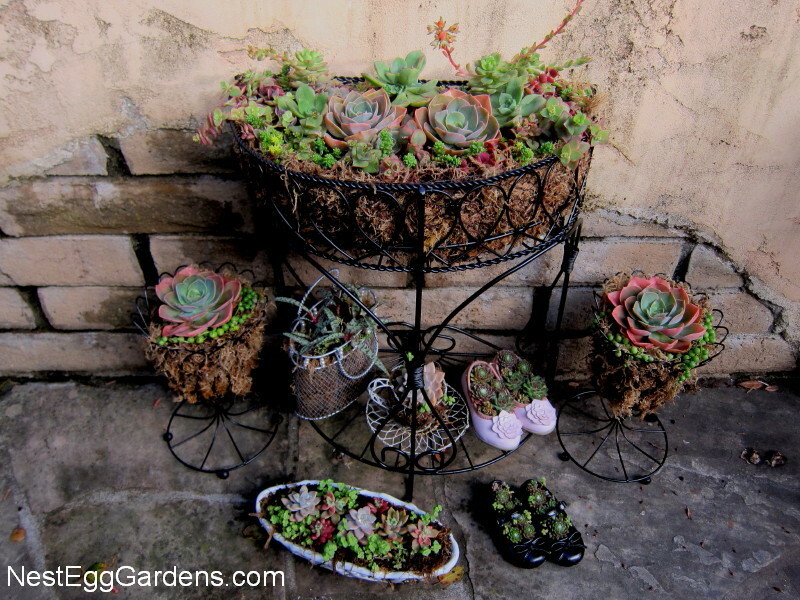 This entry was posted in Flora, Living Art, Succulents on February 8, 2015 by Shelly. 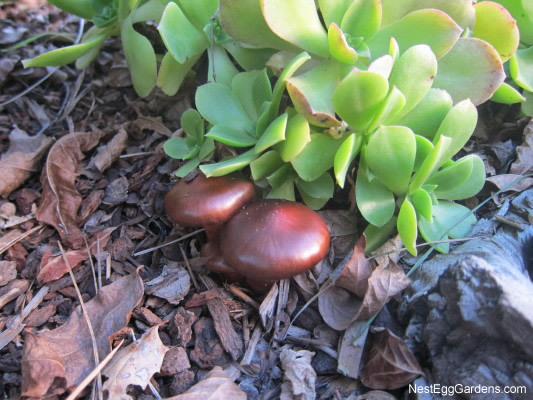 These unusual mushrooms sprouting up next to a clump of Aeonium caught my attention. They were so shiny and copper colored… so pretty. They almost look fake. 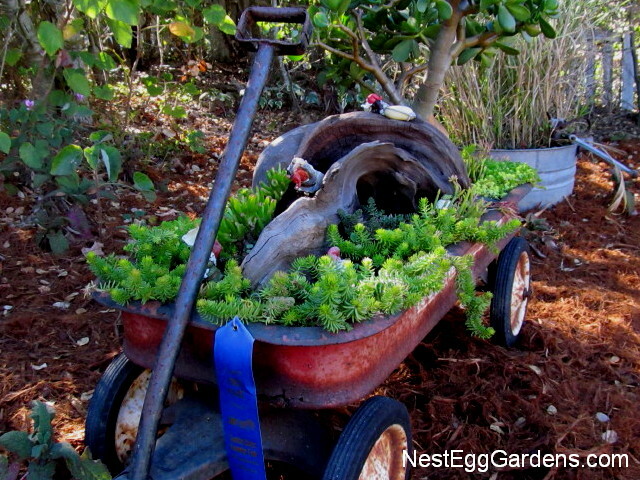 This old wheelbarrow has a flat tire, but still holds a full load of succulents and bulbs. 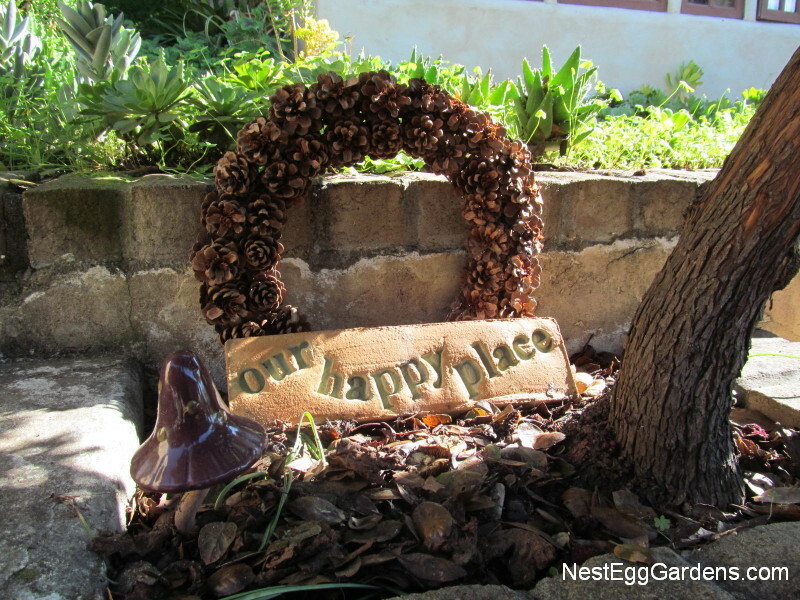 This entry was posted in Flora, Grounds, Succulents on January 24, 2015 by Shelly. 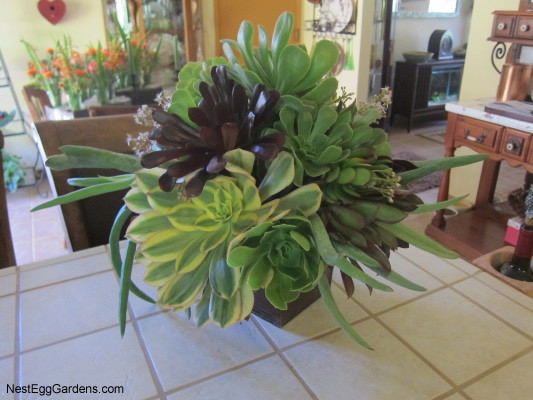 When you cut back succulents that have grown tall and leggy, leave the stem long and you can use them just like flowers in a table arrangement. 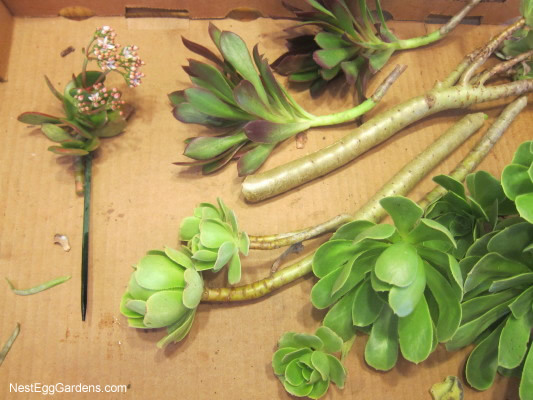 To extend the stems, you can use florist picks (green wooden sticks w/wire on one end) like the jade cutting on the left. It helps to use florist foam with water in a container to weigh it down and hold the stems securely, but a vase would work. 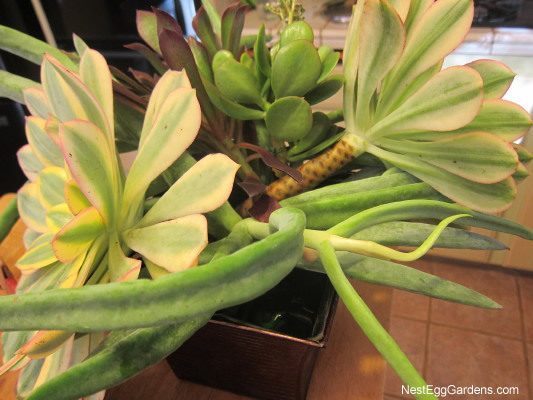 Think out of the box because the cuttings really don’t even need water. The bouquet will last for weeks, sprouting roots and eventually growing into the florist foam. The cuttings can be planted in the ground or a pot at any time… or you can take more cuttings from the new growth and start again. 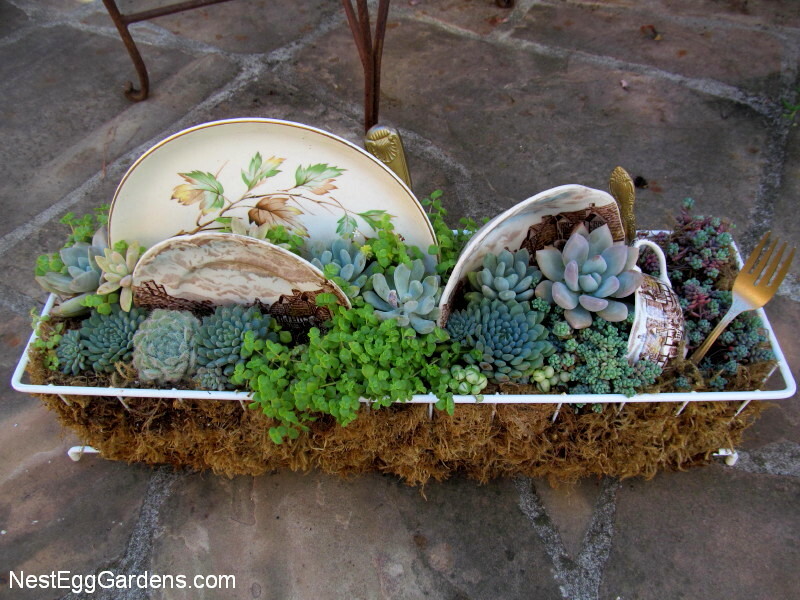 This entry was posted in Flora, Living Art, Succulents on January 21, 2015 by Shelly. 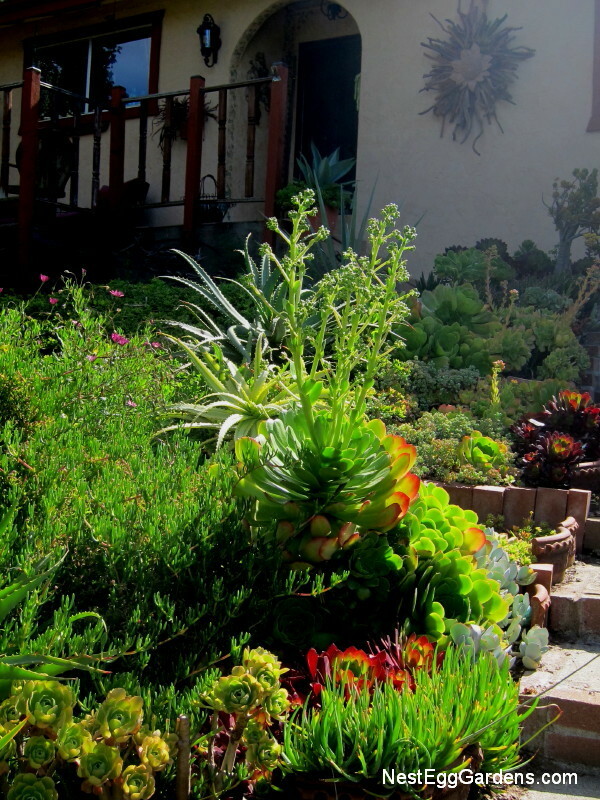 Succulents bloom at different times of the year… all year it seems. 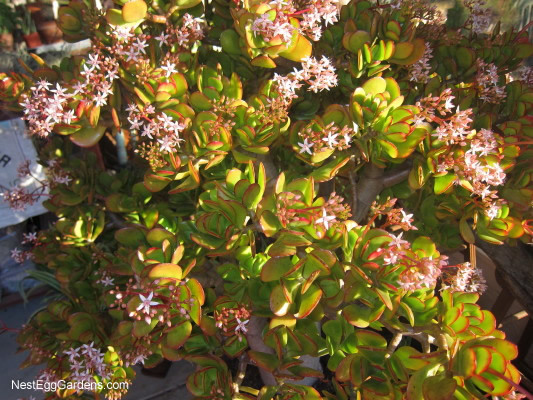 The small form of Crassula radicans starts blooming in January. Dainty white clover type flowers look even better when planted in full sun, because the leaves will be more red in color. 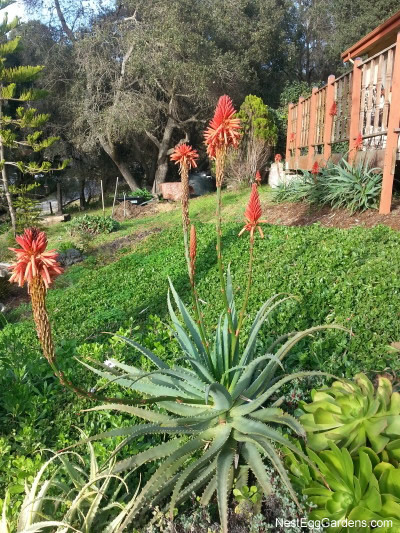 Mature Jade plants and Aloe have been blooming since the end of November. 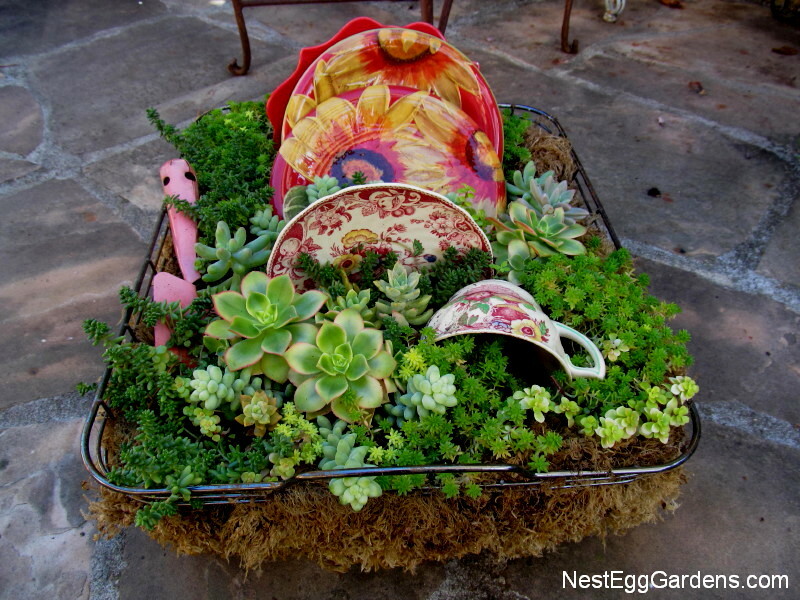 This entry was posted in Flora, Living Art, Succulents on January 16, 2015 by Shelly. 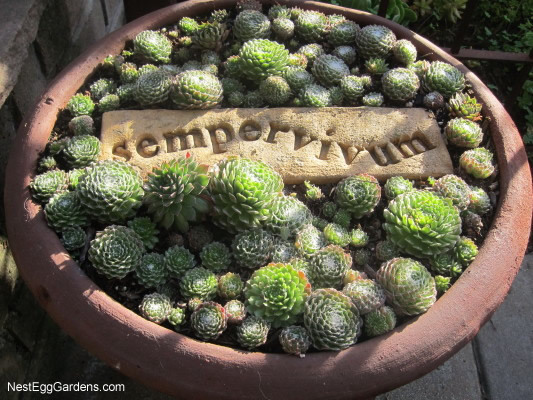 Succulents thrive year around as long as they are protected from freezing temperatures. 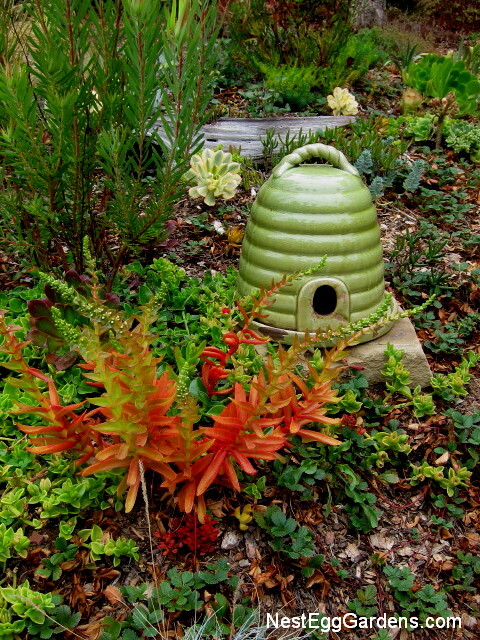 Moved up against buildings or under trees and shrubs, is all they need to make it through our occasional frosts. 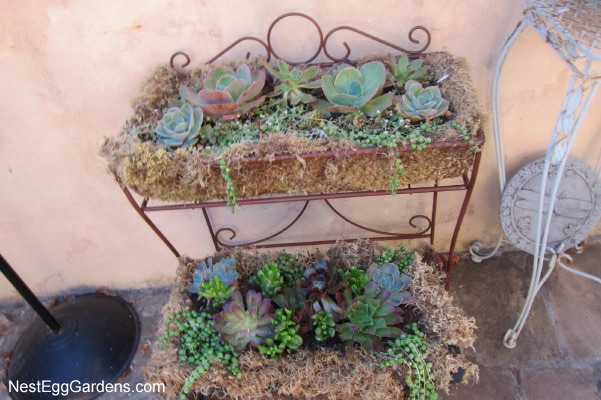 This entry was posted in Flora, Succulents on January 16, 2015 by Shelly. 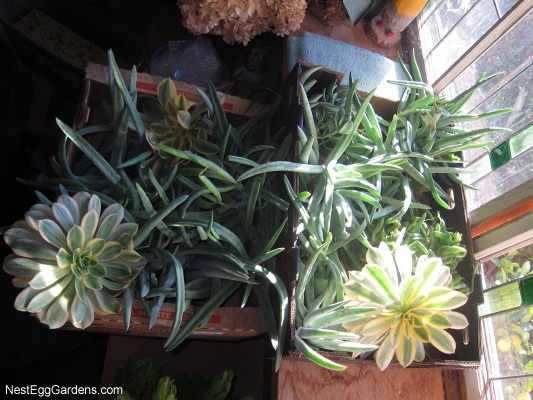 When the forecast called for three nights of freezing temperatures, I took some succulent cuttings of particular tender varieties (Sunburst Aeonium, Dudleya, etc.) that were growing in unprotected areas and stored them in the garage and greenhouse. The cuttings will survive just fine for a month or more, growing roots after a couple of weeks. 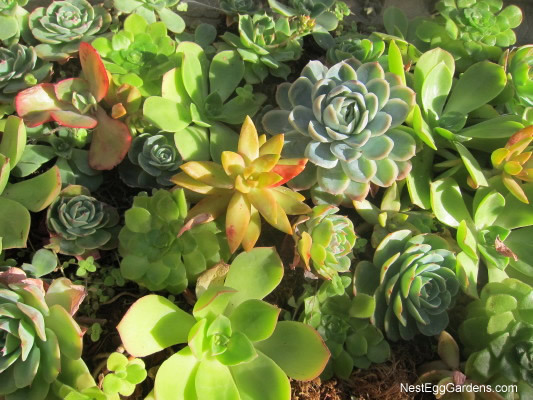 They can replace those plants killed by the freeze when the weather warms up… just by sticking them back in the ground. 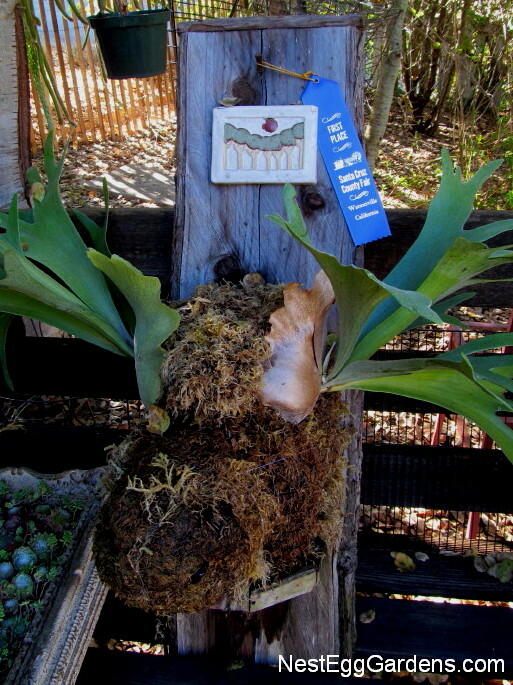 Staghorn Ferns are also sensitive to the cold, so they spent a few nights in the greenhouse, where the temperature doesn’t drop below 40 degrees. 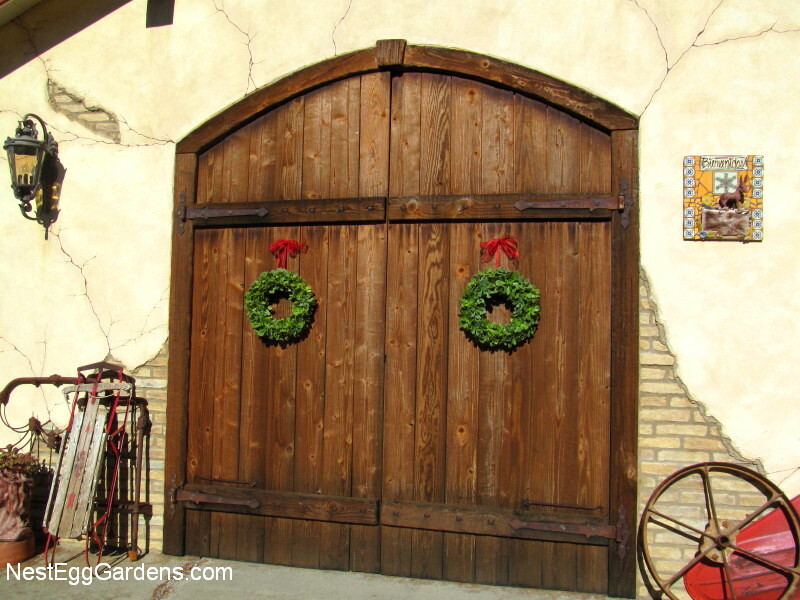 This entry was posted in Flora, Greenhouse, Grounds, Staghorn, Succulents and tagged Winter on January 4, 2015 by Shelly. Portulaca (aka Moss Rose) is a wonderful succulent ground cover that produces lots of frilly, rose-like flowers in poor soil, with minimal water. 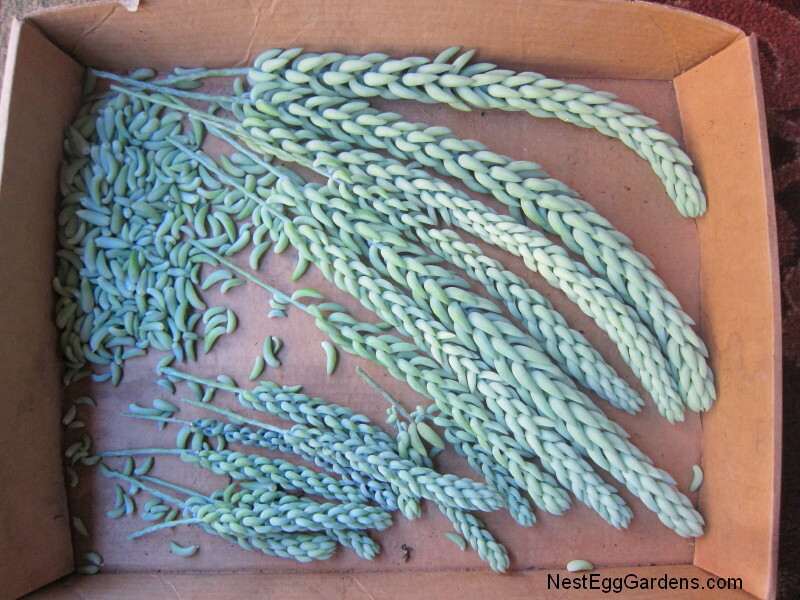 They self seed freely, but you can also start them from cuttings. When mine start looking lanky, I trim them and pot them up like this. 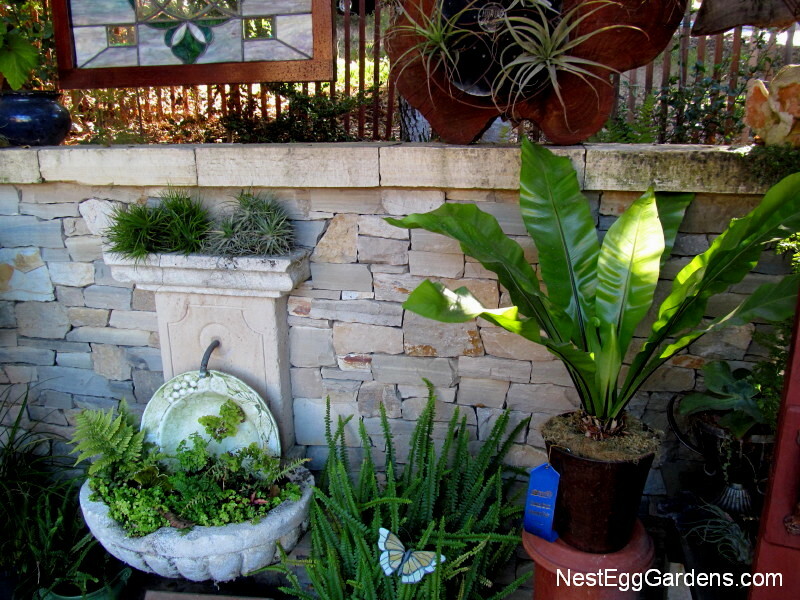 More plants are ready soon to brighten up all those dry spots in the yard. 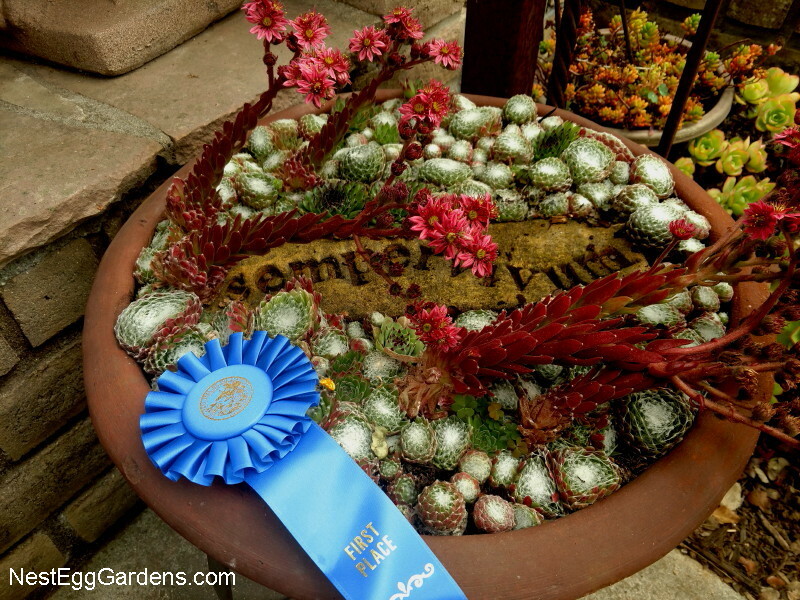 This entry was posted in Flora, Succulents on September 25, 2014 by Shelly. 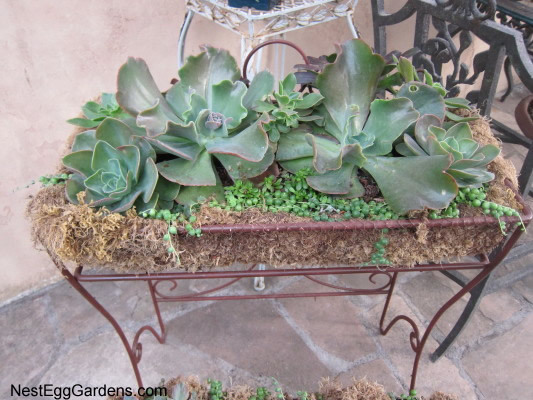 It’s easy to refurbish succulent containers when they get overgrown and leggy. Almost as easy as arranging flowers in a vase. 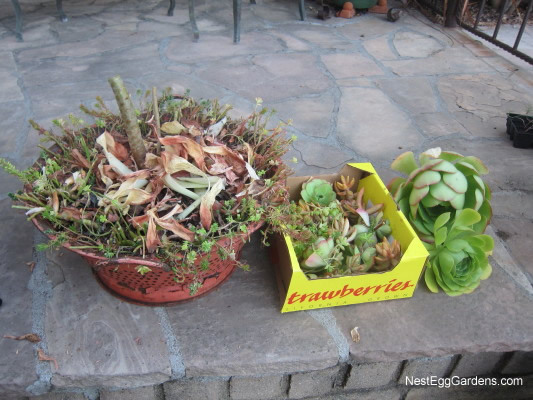 Take cuttings of the succulents that you want to replant and set aside. 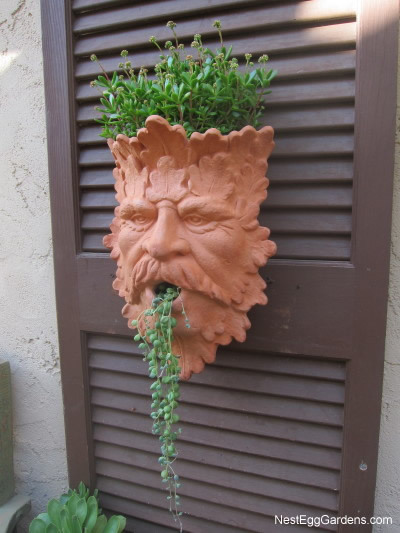 They can be stored face up, in a shady spot, for up to a month. 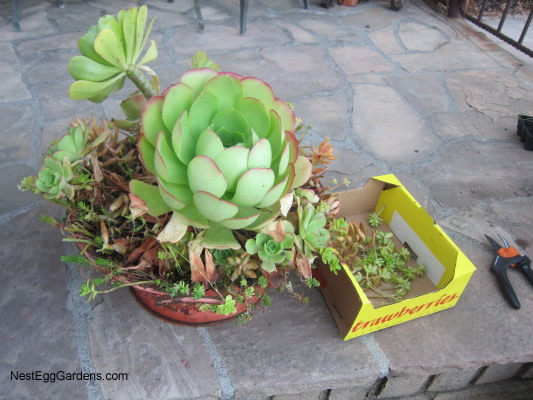 Trim up any succulents that are left or start fresh with new potting soil.Â Poke holes in the soil and stick in the cuttings where desired. Water once a week and provide at least half sun. It only takes about a month for the succulents to fill back in nicely. 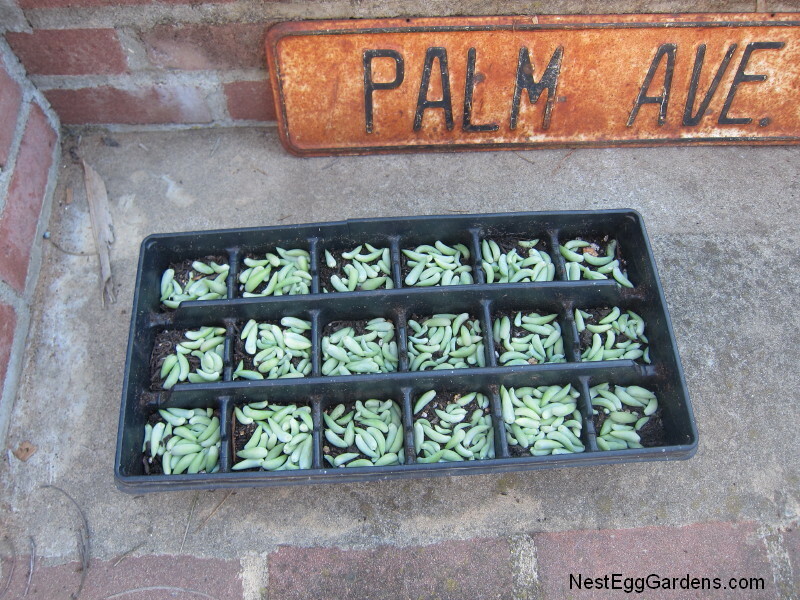 This method also works for succulents in the ground. 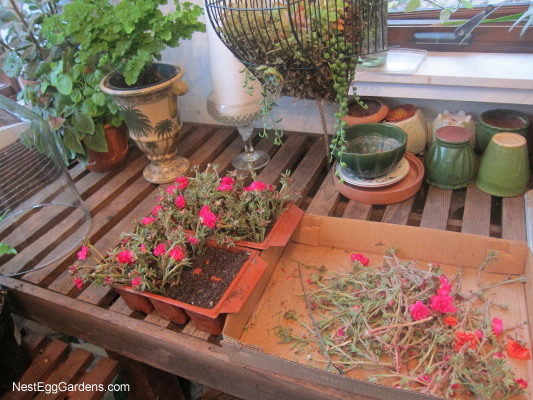 Take cuttings and stick them right back down in the soil. 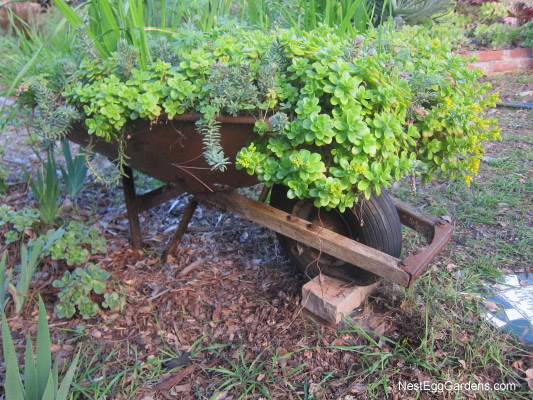 Dig out or trim the old stem… it will often come back with new growth. 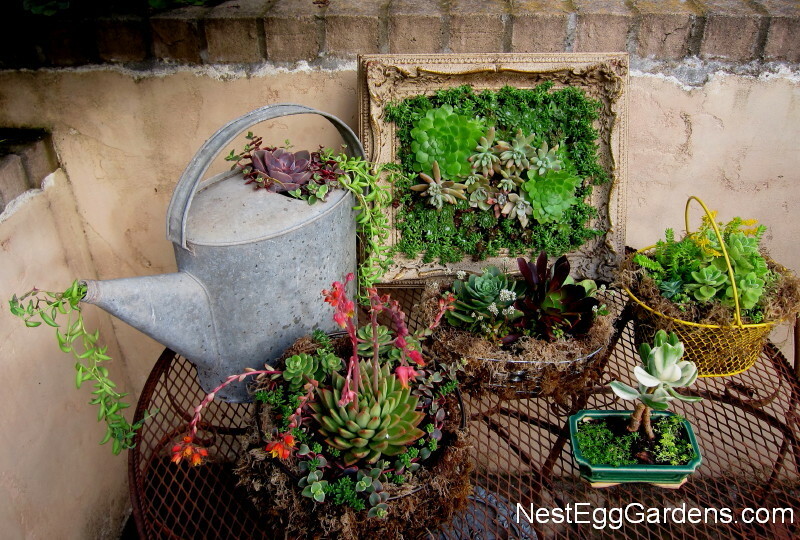 This entry was posted in Flora, Living Art, Projects, Succulents on September 24, 2014 by Shelly. 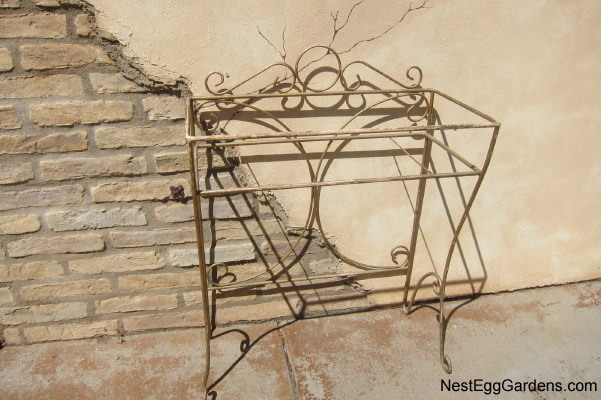 Found this metal vanity at a yard sale… and thought it would look great planted with succulents. 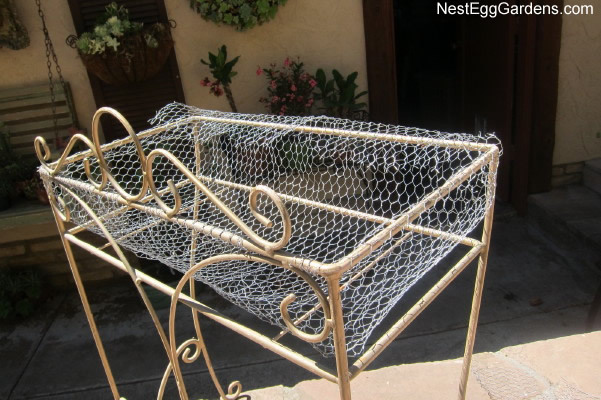 I attached a basket of wire to hold the moss and soil. 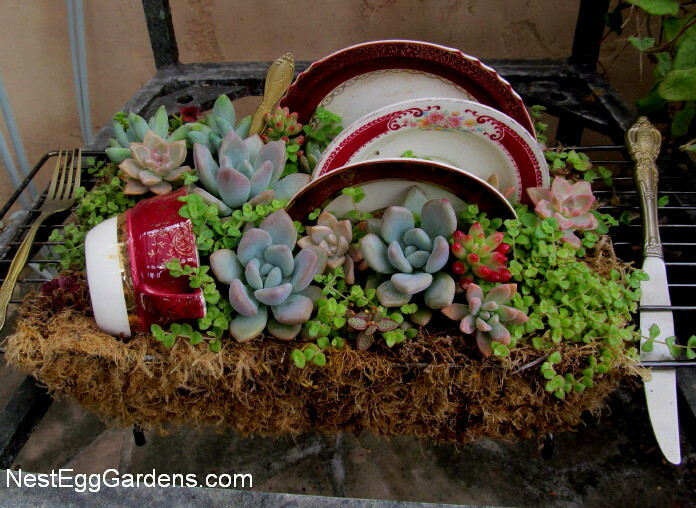 Planted with succulents and cuttings… along with a small side table. Parked under the shade cloth arbor, and watered once a week or so. 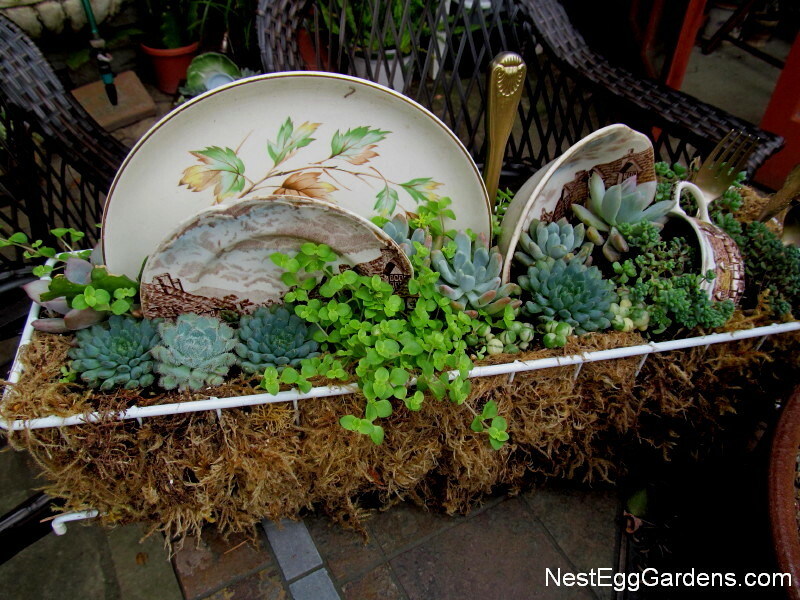 This entry was posted in Flora, Living Art, Projects, Succulents on November 15, 2013 by Shelly. For two to four weeks, the wreaths have laid flat where they get 2-3 hours morning sun, and dunked into rain water when dried out (about once a week). Stuck a few more cuttings into the bare spots and they are ready to go.Â They sold that day – at a bargain price of $60 = 14″ $45 = 10″ to a returning customer. See How to Part 1 & Part 2. 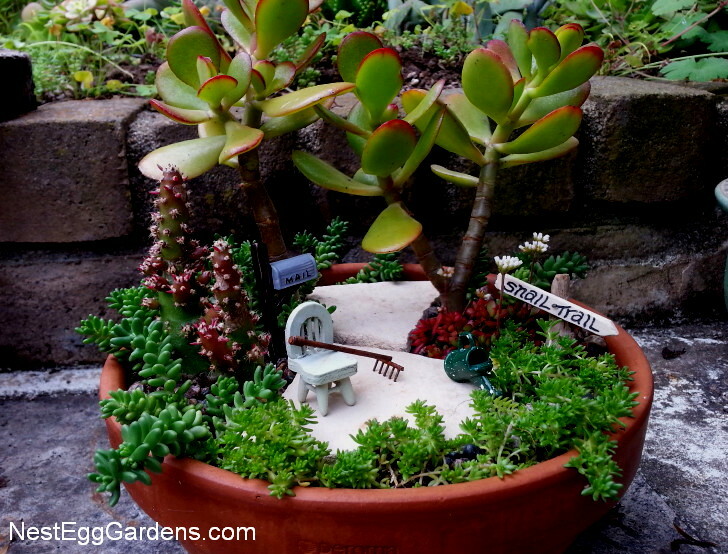 This entry was posted in Flora, Living Art, Projects, Succulents on September 19, 2013 by Shelly.